Reference number for this case: 10-sep-54-Quarouble. Thank you for including this reference number in any correspondence with me regarding this case. Recently, in the Somme and the Pyrenees, flying saucers were seen in the sky. Mr. Marius Dewilde, aged 34, workman of the steel-works of Blanc-Misseron, resident of Tuarouge [sic, Quarouble], in the Nord, saw, him, the other night, at about 2:30 a.m.. within [... ] approximately of his garden, a dark, high shape of 3 meters height and a diameter of 5 meters. Then two strange small beings, measuring approximately one meter, came running out a nearby path. Then, the apparatus, whose door had opened and closed again, rose of ten meters, after having wavered one moment. A very sharp light spout out and, similar to a ball of fire, the machine disappeared towards the West. Valenciennes, September 12. -- An inhabitant of Quarouble, close to Valenciennes, Mr. Marius Dewilde, aged 34, workman in a workshop of the north of France in Blanc Misseron, domiciled at the railway crossing #79, stated that Friday evening, around 10 p.m., his attention was drawn by the barkings of his dog. He came out immediately, equipped with a flashlight, and saw on the way skirting his dwelling, in a particularly deserted place, a dark mass, of oval form, which could be six meters in length and three in height. Directing his lamp in another direction, Mr. Dewilde saw two strange and squat men, whose size did not exceed one meter, moving quickly towards the machine. These men had a short head on which the rays of the lamp is said to have been reflected as if they were spheres of glasses. A few moments later, an intense square of light appeared on the sides of the machine. The witness is said to have then closed his eyes. When he reopened them, the light and the strange beings had disappeared. The apparatus, slightly swinging, went up vertically while releasing smoke, arrived at ten meters of the ground, the lower part of the machine reddened and it disappeared quickly. Mr. Dewilde announced this strange appearance to the police force of Onnaing. The Air police force went on the spot but no trace was noted. A metal-worker of 34 year old, Mr. Marius Dewilde, resident of Quarouble (the Nord), claims to have seen Friday, at about 10:30 p.m., on the railway located at a few meters of his garden, a dark mass which he initially took for a cart. But he heard steps on other side of the balustrade of the garden and directed his flashlight in this direction. He then saw two beings covered of diving-suits. They were of small size, not more than one meter, but very broad of shoulders. They had legs proportioned with their size, but Mr. Dewilde does not know if they had arms. He then wanted to prevent the escape to the two strange characters, but a port-hole of square design opened in the dark mass posed on the way. A green ray spout out and Mr. Dewilde was, it seems, paralysed on the spot. When the projector died out, he finally recovered his freedom of movement, but the two "Martians" had gone up in their apparatus which had risen above the ground vertically. It was a machine having the shape of a cheese cover, 3 meters high, a diameter from 5 to 6 meters, which disappeared quickly towards the west. The Air Police force investigated, but fail to find any trace on the way crossed by the "Martians." "My wife and my son just went to bed, and I read by the fireplace the account of the accident of "L'Abeille". The clock hung above the cooker marked 10:30 P.M., when my attention was drawn by the barkings of my dog Kiki. The animal howled madly. Suspecting the presence of some prowler in the yard, I took my flashlight and went outside." "While arriving in the garden, I saw on the railway, within less than six meters of my door, on the left, a sort of dark mass. It must have been a peasant who left his carriage there, I initially thought. I will have to inform the police officers at the police station tomorrow, so that they remove it, or there will be some accident at the first hour." "At this time, my dog came towards me, crawling, and suddenly, on my right, I heard a noise of hurried steps. There is a path which one calls "the path of the smugglers" because smugglers use it sometimes, at night. My dog had turned again to this direction and had started again to bark. I lit my flashlight and projected its light towards the path." "What I discovered had nothing in commun with smugglers: two "beings" as I had never seen before, at no more than three or four meters of me, just behind the palisade who only separated me from them, were marching one behind the other in the direction of the dark mass which I had noticed on the railway. One of them, the one that went in front, turned to me. The beam of my lamp came right at the place of its face, a reflection of glass or metal. I had the clear impression that its head was enclosed in some diving-suit helmet. The two beings were besides clothed in one piece suits, similar to those of the divers. They had a very small size, probably less than one meter, but extremely broad of shoulders, and the helmet protecting the "head" appeared enormous to me. I saw their legs, small, proportioned with their size, it seemed to me, but on the other hand I did not see an arm. I am unaware of whether they had arms. The first second of stupor went by, I rushed towards the door of the garden with the intention to circumvent the palisade and to cut their path to capture at least one of them." "I was at no more than two meters of the two silhouettes when, spouting out suddenly through a sort of square of the dark mass that I had initially seen on the rails, an extremely powerful illumination, like a magnesium flash, plugged me. I closed my eyes and wanted to shout, but I could not. I was like paralysed. I tried to move, but my legs did not obey me any more. Thrown into a panic, I heard as in a dream, within one meter of me, a noise of stepping on the cement flagstone which is posed in front of the door of my garden. In fact the two beings moved towards the railway." "Finally, the projector died out. I regained the control of my muscles and run towards the railway. But already, the dark mass which was landed there rose off the ground while slightly balancing as would an helicopter." "However I had been able to see a kind of door closing itself. A thick dark vapor spouted out underneath it with a light whistle. The machine went up to the vertical to about thirty meters, then, without ceasing taking altitude, fled towards the west in direction of Anzin. From a certain distance, it took a reddish luminosity. One minute later, all had disappeared." A new flying saucer is said to have come down from the sky and to have landed in the night from Friday to Saturday at 10:30 p.m. on the territory of Quarouble, close to Valenciennes, near the railway crossing 79, on the railway used by the national collieries. "It was 10:30 p.m.," Mr. Marius Dewilde, aged 34, noted, "when my attention was drawn by the barkings of my dog. Believing in the presence of prowlers in my farmyard, I went outside equipped with a flashlight. At less than six meters of the door of my dwelling, I saw a dark mass. In a small path, emerging in my grazing ground, I saw two small men who ran towards the railway crossing. I directed the ray of the lamp. The ray was reflected on the head of the one of them as on glass. Besides, this head appeared rather large to me, but I did not have time to detail it, at the same time the door of the machine opened. A sharp light dazzled me as it would have happened with a magnesium flash. Dazzled, paralysed by the fear, I saw the door being closed again, the apparatus oscillate slightly, rise at some tens of meters, then to slip by like a flash in the direction of Anzin, i.e. towards the west." Mr. Dewilde, invited to describe the saucer, further indicated that it was of round form, maybe conical. According to his indications it was estimated that it could be approximately three meters high and six meters in diameter. At the time of its rise, it let escape a little smoke and reddened until resembling a ball of fire. When he had recovered his spirit, Mr. Dewilde went to awake his wife, a neighbor, and ran to the gendarmerie, then to the police station of Onnaing. Police chief Gouchet found in front of him a man shalking of all his members, suffering of intestinal contractions which obviously excluded the assumption of an act. In his district, Mr. Dewilde has the reputation of being a balanced and intelligent man. Yesterday, the Air Police force came to inspect the location, but no trace were found. It was only observed that a piece of the ballast had been recently exposed. QUAROUBLE, FRANCE -- (Reuters) -- A steelworker here claimed a baby flying saucer paid him a visit over the weekend here and two little armless men in space helmets came out for a look around. But when he run up for a closer look, Marius DeWilde said, a bright green light seemed to paralyze him abd the strange machine made a clean getaway. DeWilde, 34, said he was reading a book in his kitchen Friday night when his dog began to bark. He peered out the window and saw a "black mass" of some kind on the nearby railroad line. When he flicked on his flashlight he saw two little creatures about three feet tall, but with wide shoulders, he said. He described the men as having legs, but no arms, and big space helmets on their heads. He said the "saucer" was something like a "cake cover," about 18 feet in diameter. Last he saw of it, he said, was a cloud of black smoke hissing out as it rose into the air. Police said they found burn marks where the "cake cover" is said to have landed, but could find nothing else. For the first time since the appearance of mysterious machines called "flying saucers", in Quarouble, close to Valenciennes, the traces left by one of these apparatuses were assessed. Six claws, laid out in half-circle on cross-pieces of a little used railway line, seem to prove that in this place a contact or a friction occurred between wood and a harder material. That is all that can be stated for the time being. But the services of the police force of the Air Force which photographed each print and took some of the scattered stones on the ballast perhaps already drew some other conclusions which they will jealously keep under the cover of military secrecy. For if the public remains skeptic with respect to all that refers to the "Flying saucers", it is not the same with the police force of the Air with which has a one section especially in charge of investigations in that matter. Hitherto, no material fact had come to corroborate the statements of the witnesses and perhaps this is why the traces in Quarouble will make it possible to see a part of the truth. Undoubtedly, the story starts well for the disbelievers since it is told by... Marius Dewilde. But the burst of laughter which accommodates this firstname [*] ceases when the story is told. To obtain more guarantees, it is not to Mr. Dewilde that I asked to tell the facts he witnessed on Friday September 10. Because at this day, he could have been influenced by the questions of the investigators and tens of journalists who raveled at his place. The interrogations which he underwent to check if it did not lie or if he was not the victim of hallucination, could work his imagination, and, involuntarily, he would be likely today, to add details to the primitive account. This normal phenomenon happening to the most balanced men would be all too explainable since for almost a week now, Mr. Dewilde has read in the "trash press" about stories which do not have anything anymore resembling his statements. [*] The first name Marius is supposed to make everyone laugh because it is the generic firstname used in any invented exaggerated stories. "Marius" is the archetype of the simple guy from Marseille who would made any wild claims. Of course Mr. Dewilde's credibility has nothing to do with the archetypes attached to his firstname. Mr. Dewilde's home - a railway crossing guard house - is isolated at the edge of a small wood, at approximately a kilometer and half from the national road of Valenciennes to the Belgian customs of Quiévrain. A dirt track, hardly suitable for motor vehicles, leads from the road to the house: it is actually used only by farmers who go to their fields. The house is located in a triangular space separating two railways. One, employed only by the mines, leads to the mine of Quiévrechain; a train a day passes by there. The other goes from Blanc-Misseron to Odomez; a merchandise train descends in the morning in the direction of the border and goes up the evening in opposite direction; it is on this railway that the traces are. Let us imagine that we are last Friday, Mr. Dewilde reads, in his kitchen, his illustrated weekly magazine. It is approximately 10:30 p.m. His wife and two sons aged 14 and 2 years 1/2 slept on the first floor - in the mansard-roofed room. For a few minutes already, Mr. Dewilde has heard the dog barking outside, but he does not pay attention to it. However, irritated by these barkings, he finally stands up, takes his flashlight and opens the door of the kitchen that gives on a small enclosure contiguous to the railway line, he shouts "Kiki, will you stop it already?" When he said these words, he saw a dark mass posed through the railway, which he mistakes for a carriage loaded with hay. A farmer - knowing that no train goes by at night - can, indeed, have abandoned its loading until the next day morning. At this point in time Mr. Dewilde hears noise in the small way connecting the two railways. Instinctively, he directs the flashlight in the direction of the place from which the noise comes. And in the ray of light a man appears - a small man who runs while moving towards the "dark mass." It is a child, he thinks, but while looking better, he sees a second man, behind the other, and so he supposes they are defrauders, for he thinks he makes out a heavy pack on their back. And then brutally he is blinded by a light; which surprises him. When his eyes can see through the darkness again, the machine - which he mistook for a carriage loaded with hay - rises vertically while rocking, and moves away quickly above the railway releasing a small flame at the back, without making more noise than a gentle humming. Only then did Mr. Dewilde realize that he has just been the witness of an extraordinary event. He rushes into his home and shouts to his wife: "Come quickly, there is a "thing" which flies away on the railway. It is a weird machine, and there are men!" Awaken up too fast, Mrs. Dewilde does not react immediately, and when her husband returns outside, the mysterious apparatus had disappeared. Mr. Dewilde decides, at once, to go to warn the gendarmerie of Quiévrechain, in spite of the his wife who asked him to wait until the next day morning. "It is my duty to go there, he answered, according to Mrs. Dewilde. That will perhaps be useful to them." And, jumping on his motorcycle, he leaves for Quiévrechain - distant of more than 3 kilometers - skirting the railway which leads to Blanc-Misseron. But there is no permanence at the office of the gendarmerie, and the door remains hopelessly closed, in spite of the insistence of Mr. Dewilde, to ring the bell and hit the door. He then goes into a nearby coffee shop, where he explains what he has just seen. The skepticism of the customers is shaken all the same by his account and his state of excitement. Somebody then suggests to him going to the police station of Onnaing. Mr. Dewilde thus resumes his road travel and crosses the six kilometers which separate Quiévrechain from Onnaing, where he arrives shortly before midnight. The officers in duty are also struck at his attitude: "he was pale, they told me, and was shaking like a man who had just had a great fright." However, the police officers refuse to wake up the chief detective, but they promise that he will visit Mr. Dewilde early in the morning. The latter thus regains his residence, at approximately four kilometers, and he buckles his night excursion. After his departure, the officers change their minds and alert the chief detective all the same, Mr. Gouchet, who will collect in the morning of the next day, the statement of Mr. Dewilde on premises of the adventure. In front of the sincerity of the witness, he will alert the Air Police force, and they will record the traces that we mentioned. Such is the veracious story of the "flying saucer" of Quarouble. The police chief of Onnaing, like the investigators of the services of the Air Security, refuse to say anything more for the excellent reason that they know nothing more. All that they would add would distract away from the truth and would lead in the field of deductions and assumptions. One can admit initially that Mr. Dewilde, wanting to have people talk about him, invented this uncanny history completely. "If this were the case, answered Mr. Gouchet to me, Mr. Dewilde would be, at the present time, in jail for insult to the authorities. I have experience of interrogations, and I can vouch that Mr. Dewilde does not invent anything. This is also the opinion gathered by the Air Police force. you can't make up such a story without betraying yourself, at one time or another." There are also elements which prove the good faith of the witness. He crossed, in the middle of the night, some fifteen kilometers to inform the authorities. H showed signs of his fear. But if Mr. Dewilde did not want to mislead, he could have been mislead. Wasn't he victim of hallucination? Mr. Gouchet answers this question too. "I thought of that, too. Thus, I examined the last readings of Mr. Dewilde. In the evening of the event, he read a weekly magazine in which there was nothing about flying saucers." He is not stuffed with science fiction novels, and reads only few illustrated magazines in addition to his daily newspaper." Moreover, Mr. Dewilde is a balanced and sensible man, and he was in no way predisposed "to see a flying saucer." And furthermore, it is only when the apparatus flew away that he thought of the "saucers." Hitherto, he mistook the dark mass for a carriage loaded with hay, and the two men for defrauders. In addition, more than ten people stated to have seen, that evening, around 08:30 p.m., either a "fireball," or a "disc letting escape a trail of fire" in the sky. All testimonies agree to state that the disc moved towards Anzin. And actually, it is indeed towards this direction that Mr. Dewilde saw this mysterious thing which rested on the railway move away. Do we have then to suppose that there was a collective hallucination of people who did not know each other and were not together at this time? Some chattered on the step of their door, others were closing the window of their bedroom, some, finally, were going home. Last point to be cleared up: who were these "small men". In his statement, Mr. Dewilde says that they were no more than one meter tall. He initially thought that were children, then "defrauders carrying a heavy burden." finally, he saw that a "sort of diving-suit" covered them. Is all that incredible? Before, it is wise to specify that 1°) the scene did not last thirty seconds; 2°) the night of Friday to Saturday was extremely dark; 3°) the wind blew with strength. Mr. Dewilde thus did not have time to "examine" the individuals. He saw shades and his flashlight allowed him to note that they were covered with special clothes. But aren't aviators provided, them also, of a full combination and a special helmet allowing them to confront high altitudes? Can't men, of average size, curved so that they are not seen, appear as "small men" in particular when the width of their combination still makes them appear smaller? These plausible assumptions that the police force emits authorize to believe in the sincerity of the witness. Would they Martians landed on French soil? Three inspectors of the air police returned to Quarouble (North) to hear Mr. Marius Dewilde, the man who "saw" two Martians to the garden gate. 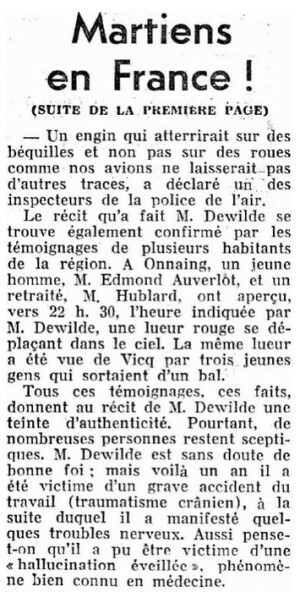 They left the village believe that on the night of Friday to Saturday, a mysterious flying object has landed, as stated by Mr. Dewilde, on the railway Saint-Amand - White-Misseron near the crossing 79 . The findings seem they could do, indeed, confirm the testimony of the metalworker. The latter said that on Friday to 22 pm. 30 he saw an oblong craft, 3 meters tall, long 6, placed on the track, a few meters from his house. Two beings of human appearance, very small and, apparently, wearing suits, were nearby. Mr. Dewilde walked toward them, but at that time, the craft leveled on him a beam of light green reflection, which had the effect of paralyzing it. When he regained the use of his limbs, the machine began to rise in the sky and two people were missing. Investigators have found no trace of the existence of these two characters. The surrounding ground, examined meter by meter, has not delivered a pitch mark. On the other hand, one of the sleepers showed signs that have been made by a machine at the time of landing. In five places the wood of the cross is tapped over approximately four square centimeters surface. These brands all have the same appearance and are arranged in a symmetrical manner, on the same line: three of them - those in the middle - are separated by a gap of 43 centimeters. The last two are distant previous 67 centimeters. A machine which would land on crutches and not on wheels like our planes would not leave different traces, satted one of the police of the air inspectors. The report Mr. Dewilde made also finds confirmation by testimonies of several residents of the area. In Onnaing, a young man, Mr. Edmond Auverlot, and a pensioner, Mr. Hublard, saw, at approximately 10:30 p.m., the hour indicated by Mr. Dewilde, a red gleam moving in the sky. The same gleam was seen from Vicq by three young people who left a ball. All these testimonys, these facts, give to the account of Mr. Dewilde a color of authenticity. However, many people remain skeptical. Mr. Dewilde is undoubtedly of good faith; but one year ago he was victim of a serious industrial accident (cranial traumatism), in the continuation of which he showed some nervous disorders. So one thinks he might have been the victim of " waked up hallucinations", well-known phenomenon in medicine. Two of the alleged landings (on 10 September) in France of "flying saucers" are considered by the local air police to have been nothing more than the landing of planes used in smuggling. Furthermore, in one case, the farmer in Correze Department stated that the pilot uttered unintelligible words; but the farmer was certainly no polyglot and could easily have been fooled. In the other case, in Valenciennes Departement, the witness may have been sincere, but it should be noted that he had a cranial traumatism one year ago and several nervous disturbances since. It is true, however, that in the latter case, the air police found four unusual marks on the railroad ties near the spot indicated by the witness, marks that could have been made by the tools of railroad workers. Note: the first case is the Antoine Mazaud case, refer to the corresponding file for September 10 in Mourieras, Correze. 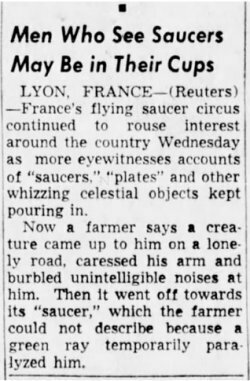 LYON, FRANCE, -- (Reuters) -- France's flying saucer circus continued to rouse interest around the country Wednesday as more eyewitnesses accounts of "saucers", "plates" and other whizzing celestial objects kept pouring in. Now a farner says a creature came up to him on a lonely road, carressed his arm and burbled unintelligible noises at him. Then it went off towards its "saucer", which the farmer could not describe because a green ray temporarily paralyzed him. A plague of "flying saucers" and other mysterious craft is sweeping Europe, and the number of recorded testimony shows that France appears to be particularly targeted. There is no day, since weeks, where many of these events are reported from the Vendée, the Moselle and the Quiévrain to the Bidassoa. In the Limousin, in particular, where a farmer was embraced on September 10, by a stranger; although he was peaceful, terror took hold, especially in the area of Roches (Creuse), where children no longer dare to go to school alone and where shepherdesses no longer want to keep their flocks since a dark shadow was reported hiding in the brushes. There is concern that the friendly Martian re-embarked leaving on the earth one of his companions. In Diges (Yonne), two women saw each in her turn, a cigar land in a meadow and its pilot was leaning, perhaps on its engine. The "being" was of normal size, dressed in khaki and wearing a cap, but they were so scared that by the same reflex, they fled and locked themselves in. Malenkov and Eisenhower shaking hands around a "saucer"
A pseudo-writer, on the contrary, delighted that these fantastic creatures come to join his philosophical ramblings, assimilates the "anti-saucerists" to troublemakers and warmongers. He writes without smiling: "These cigars and saucers could well make all of us agree. Perhaps this is why some people do not want to hear about it. Think about it! Eisenhower and Malenkov shaking hands around a saucer! What an idea!" What to think of this new fever? Should we follow in their disdainful disapproval those who believe without verification, it is all hallucinations - sometimes collective - or should we believe with the others these are real craft originating from the human genius or more romantically coming from another world? No doubt it is better to examine things more closely. The case now takes a too serious turn for trafficking in nonsense or admit all the news. It is time to grasp the problem and reason healthily on the sum of elements accumulated since more than seven years. For it is on June 24, 1947, that the first "saucers" were reported in the manner described thousands of times since. It was an American businessman, Kenneth Arnold, who saw that day "nine luminous discs flying in formation at high altitude" when he had taken off from Chehalis (Washington) on a personal plane. He could see that these "craft" were "flat like frying pans or saucers" before their disappearance and, if the case made little noise, the term "flying saucers" (soucoupe volante) was already launched. These words were the last and no one ever knew what they meant. The plane broke up in flight and the body of the unfortunate pilot was found horribly disjointed. The first reaction of Mantell's friends was naturally to think that he had been "downed" by the mysterious craft. His exclamation seemed to indicate that what he saw was awful and that monsters had fired at him. This is the first victim - the first "martyr" - who tragically marked the true arrival of the "saucers" on earth. An investigation commission was appointed, but its work was long and hard at a time when the high-speed compressibility phenomena were still unclear. When it put out its report on the accident, it finally explained that the pilot had climbed too high, probably in the pursuit of an atmospheric phenomenon. Deprived of oxygen, he had probably exclaimed that he was losing consciousness. The aircraft, abandoned to itself, had probably dislocated by diving at nearly the speed of the "wall of sound". But psychosis was already on his way. What can the fairly conservative assumptions of technicians do against the taste of wonderful and the supernatural? It is in any case strange to see that the appearances of "flying saucers" multiplied at once in America where 1,192 cases were reported, in waves, from 1947 to 1952. And it is no less surprising to see that, little by little parallel waves manifested themselves in France three to five weeks behind those recorded in the U.S.A.
Of course, the "pro-saucerists" interpret this pattern to their advantage: - We are part of the same humanity that the Americans and the "saucers" have no reason to despise us when visiting Earth. Their pilots wherever they come from can be as much interested in France and in the United States and if we see less it is because our territory is seventeen times smaller than that of the U.S.A.
Just long enough to newspapers to inform you of the virus, they reply. After the Mantell crash anyway America was so gripped by the fear of the saucers deadly saucers that it accepted all the fables. The most sensational story was published by one Franck Scully of Denver, who told in a weekkly magazine, then in a book, how a circular machine, that came from another planet, crashed in the United States, described the autopsy by a famous practitioner of sixteen little creatures found on board and stated that metal debris from the machine, heated to 10,000 degrees, had not melted. The finally palpable "saucer" and these little men in blue linen clothes made such a noise that an investigation commission - again - joined in. Frank Scully, interrogated, had to admit the "hoax". His piece of metal melted at 637 degrees and the case ended with two convictions for fraud. But once again, the explanation came too late. The book beautifully sold and the author won a lot of dollars. 1953 has not been a hot year for "saucers". In France, the first known "saucer" was reported in Antibes, in August 1949, but the following came in waves, parallel, we repeat, to those in the US. There is a fever in 1950, two in 1951 and one particularly important in 1952. That year, there were eleven appearances in May, six in June, six in July, two in August and two in September, eight finally in October. This is precisely the time when America also see many "flying objects" and made us know its anxiety. We will see how calm then returned across the Atlantic. Here, 1953 was also quiet. The saucers disappeared from our skies until last August where a new wave started discreetly in Norway with the meeting of a helicopter by two young people who were picking blueberries. This time Europe had exclusivity. The wave grows slowly, recalling the Loch Ness [Monster] who in the past returned in the heart of summer to fill the gaps in the news. But the Scottish snake was a prisoner of the lake while the "saucers" do not recognize borders nor countries nor the dreams and the real facts are now mingled with the disorder. We must reject from the first five recent stories - the most sensational alas! - just too unreliable. In Vernon, the young witness has a strong imagination well known in the region. In Quarouble, near Valenciennes, the gatekeeper who saw "little people" was a victim, one year ago, of a head injury and is subject, since then, to nervous disorders. Prints appear on the wood of the railway track, but may give rise to infinite interpretations. Near Amiens, four pranksters had to admit they had wanted to make fun of their friends. In Bugeat (Corrèze), Mr. Mazaud has probably been embraced by someone but the air police firstly believes in a light aircraft that came in this deserted place at dusk, for a rendez-vous with a smuggler. In Craintilleux finally, near St-Etienne, the giant, Hitler lookalike, double-faced (one grimacing at the front and the other, jovial, at the back) climbed in his saucer without opening the door, in the manner of wall-crossing ghosts, really seems too childishly wonderful. Witnesses, actors and writers have probably the romantic spirit that suits this kind of occurrence. And the Martian they thought they saw will at least have the advantage of providing them something for a play or a novel. Medicine knows about these awaken hallucinations which can be experienced by completely normal people. Who did not see in the dark shadows move where there was nothing? It should be noted in this connection that virtually all reported landings of "saucers" took place at night and no one has yet seen Martians having a shape significantly different from ours in daylight. Should we conclude that all recorded reports are the work of unbridled imaginations? Kenneth Arnold and Mantell were not dreamers. Most French witnesses aren' either. According to the account of the "witnesses"
The most recent testimonies of the strange passengers of saucers, cigars, and various apparatuses that landed in different regions of France agree on one point: the supposed Martians are small and different from those who appeared in Portugal and measured 2 m. 50. Mr. Marius DEWILDE, 34, metallurgist in Quarouble (Nord), saw two beings measuring one meter, with wide shoulders, but apparently without arms. They were dressed in diving suits and fitted with helmets. They pointed at the witness a ray that paralyzed him for a few seconds. Mr. Pierre LUCAS, a baker in Loctudy (Finistère), saw an "individual" measuring 1 m 30 come out of a saucer and patting him on the shoulder uttering unintelligible sounds. His face was oval and hairy and his eyes were "the size of a raven egg". Mr. André NARCY, 48 years old, a roadmender in Mertrud (Haute-Marne), saw a 1.20-meter-tall being disembarking from a saucer "dressed in a coat covered with hairs". Mr. Antoine MAZAUD, from Bugeat (Corrèze), saw a "medium-sized" being wearing a motorcycle helmet. M. Lucien BORDET, storekeeper, 9 rue Lapérouse, Paris, saw at the Bois de Boulogne three "beings" of 1 meter in height, dressed in luminous outfits and wearing helmets whose portholes concealed their eyes. One of them, who appeared to be the chief, had "six rotundities on the abdomen". The great joke of the "Martians"
MARIUS DEWILDE, aged 34, workman with the steelworks Blanc Misseron, reads a magazine in his kitchen (it would be interesting to know what this magazine was about) [the shipwreck of l'Abeille], On the first floor, Mrs. Dewilde and her son have rested already for a moment. All is quiet. Only the tick-tock of the clock and the crumpling of the turned pages break the silence. Suddenly, Marius Dewilde raises the head, attentive. Outside, Kiki, his dog, barks furiously as when a foreigner penetrates in the small garden. Somebody at this hour? Certainly not a visitor. Then? A tramp, perhaps, or a smuggler? Marius Dewilde takes a flashlight and goes outside on his doorstep. The fresh air of the night hits him in the face. During a few seconds, his eyes badly accustomed to the darkness cannot distinguish anything. Then, beyond the barrier which separates the way from the railway, he sees a dark mass, like a cart abandoned on the rails. "Hold on..., thinks Marius, a peasant uncoupled on the railway. I will have to warn the station so that it gets removed, that could cause an accident." Within three or four meters of him, on the way which passes in front of the house, two beings go one behind the other towards the dark mass seen on the railway. They are small (no more than one meter). The one from the pair who walks in front turns the head towards Marius Dewilde who has the impression to find himself in the presence of two extremely broad shouldered divers whose helmets throw metallic reflections. First amazed, Marius runs towards the garden's door, to cut the road to the unknowns. Then, in the dark mass posed on the way, a window of square design opens, from where spouts out a green ray which is directed at Dewilde. At once, the man is paralysed, nailed on the spot. His legs refuse to serve him. During several seconds, he is thus unable to make even one movement, then suddenly, the projector extincts, and Marius finds the use of his muscles. He runs towards the apparatus, but he is too late. With a whistle and a thick black smoke, the dark mass rises in space while slightly rocking. One would say a cheese cover three meters high and from five to six meters in diameter. The thing goes up... goes up... It takes a red-orange color, and disappears towards the west. Marius Dewilde and his Martians enter the legend. - AN APPARATUS WHICH WOULD HAVE LANDED ON QUILTS WOULD NOT LEAVE DIFFERENT TRACES! Marius Dewilde was victim, formerly, of a cranial traumatism in the continuation of which he had, one says, expressed some nervous disorders. Perhaps a psychiatrist would have questions to ask, but this assumption is excluded. Nobody will subject the witness to what Americans calls a "cross-examination", i.e. a true interrogation intended to find contradictions or the improbabilities in his account. In what authority, anyway, would this be done? Marius Dewilde is not a criminal or a madman. He does not threaten the safety of anybody. He did not call the police. He is perfectly free, like any French citizen, to tell what he saw or what he believed to have sees and to give of the events of which he claims to have been the witness any version which suits him or in which he believes. Under these circumstances, however, it is allowed to raise the question: where is the scientific truth? [Photograph with caption:] A few hours after Mazaud, Marius Dewilde, of Quarouble (Pas-de-Calais), saw, too, two "Martians". Moreover, he had the privilege of the diving-suits and the "paralysing ray". He also wanted, afterwards, to get a gendarme as witness. FRANCE, the land of logic, is in the full grip of the fever of flying saucers and of little men in space helmets, who make friendly, if unintelligible, advances to startled peasants, or nail them to the spot with a hypnotic "green ray." For the past 10 days there have been unnumerable flying saucer reports from peasants, doctors, milkmen, butchers, farmers, housewives, gendarmes, teachers, from the Channel coast to the Mediterranean, from the Pyrenees to the Ardennes, from Britany to Alsace. According to all these witnesses, the sky over France is alight with sparkling yellow "saucers," bluish globes, "flying cigars," (Once as dramatically reported from Mulhouse in Alsace, surrounded by "12 little cheroots"), plain aluminum "saucers," luminous "cigars," 10 "saucers" which seemed to perform a sort of ballet in the sky, and sometimes just plain "mysterious machines." Unlike earlier flying saucers, those reported hovering over France fly low, sometimes at about 600 ft, and do not flash across the sky, but remain in view for as long as 15 minutes, or remain apparently immobile. They variously spit flames, form luminous curtains of light, change color, land and take off vertically without a sound. MANY French scientists, hitherto skeptical on the flying saucer question, are reported to be somewhat shaken by the multiplicity of reports, and by the fact that some are group observations, or individual reports which tally with others received from adjacent regions. On the subject of little men or Martians, they reiterate that astronomers have never made any observations which could indicate a high form of life on Mars. They point out that Mars is a thousand million years older than the earth, and that, if life did once exist there, it probably disappeared in the pink icy deserts which appear now to abound on the planet. The protagonists of the flying saucers and the little men from Mars have been greatly encouraged by an article in the serious journal, "Forces Aériennes Françaises" (French Air Forces) written by a young aeronautical engineer, Lieut. J. Plantier, and approved by an engineer-in-chief of the Air Ministry. Lieut. Plantier shows that the reports that flying saucers remain motionless in the sky, accelerate from immobility to 10,000 m.p.h. in a few seconds without any noise, and that living beings can fly in them without being harmed by the acceleration, are completely logical if it is admitted that energy of cosmic rays has been harnessed and that machines can fly at the speed of light. 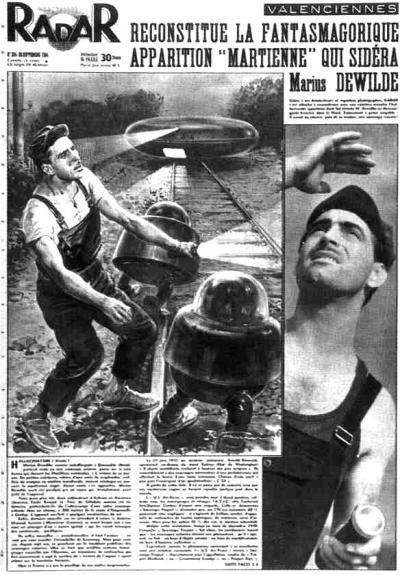 IRRESPECTIVE of the views of scientists, however, French men and women continue to report daily appearances of saucers and cigars and their encounters with the space men. First reaction of the honest French citizen in the face of any unusual happening or danger - including, it seems, phenomena from outer space - is to inform the gendarmes. Accordingly, in villages and towns, bold gendarmes have been "alerted" as the French Press has it, and have been kept busy checking reports and examining alleged flying saucer landing areas for "traces." Two gendarmes at Chateauroux in Central France themselves saw three luminous green flying objects. Their police training immediately asserted itself, and they stopped a motor car driver and a cyclist so that they too could look and bear witness. Then the gendarmes made out a full report. The only tangible evidence to date of a landing is that produced by Mr. Marius Dewilde, a 28-year-old metal worker in the North near Valenciennes. M. Dewilde, a young man with a hairline moustache, a long - and it must be admitted, humorous - face, said he first saw the "Martians" from his garden near the railway line. "Two little beings, not more than three feet high," he reported, "each wearing a sort of diving suit with metal helmet, were standing near a 'flying cigar,' which had landed on the railway sleepers." M. Dewilde had no chance to shake hands or welcome the visitors in the name of the Fourth Republic for, as soon as they saw him, they hypnotized him with a "green ray" while they leapt into their machine which, of course, took off vertically in a thick cloud of smoke without making a sound. Next day the gendarmes "alerted" at once by M. Dewilde and two inspectors of the Air Force police, found a series of strange regular marks on the railway sleepers, which could have been caused by the "saucer" in landing. MOST intimate contact with the space men was reported by M. Antoine Mazaud, a farmer, aged 58, with a bushy grey moustache, who lives near Limoges in the Massif central plateau of France. M. Mazaud alleges that a "Martian" about three feet high emerged from a "flying cigar" and began to talk in an unintelligible tongue. When he realized that M. Mazaud could not understand him, he kissed the farmer on the cheek. M. Mazaud's argumentative fellow-countrymen, questioning this strange story, immediately wanted to know why a creature from another world should adopt the habit - not even universal on earth, they pointed - of kissing. "It is surprising that he did not pin a medal on your chest and kiss you on both cheeks," they scoffed. 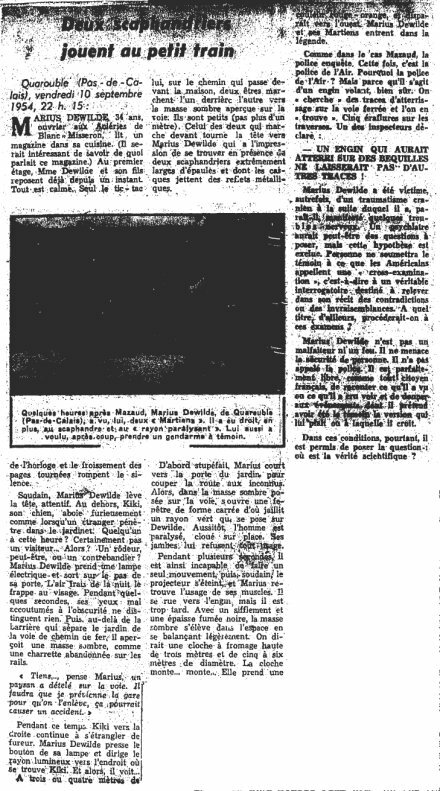 In view of this unsympathetic response to M. Mazaud's story, it is not surprising, therefore, that M. Yves David, a farmer of Chatellerault, concealed for some days the fact that he had been touched on the arm by a "space man" before being momentarily hypnotized by the "green ray" like M. Dewilde. M. David was afraid of being laughed at, he said, but eventually asked a friend if anyone else had seen the space man. The friend spread the news and, of course, told the gendarmes. Two women in the Yonne department gave independent reports of having seen a strange machine in a clearing with a pilot standing next to it. Neither stayed to investigate, however. DAILY the stories continue. No Parisians have yet reported an encounter with a "Martian," altough, as the wits point out, you would expect them to land on the "Champs de Mars" ("Field of Mars"), the esplanade in the front of the military school. Cartoonists are fully exploiting the "Martian" and flying saucer season. One, in true Gallic vein, has drawn the classic wronged husband who returns home unexpectedly. He has thrown open the cupboard door to reveal a strange little figure in a spaceman's suit and helmet, and is saying to his guilty wife, cowering in bed: "And that, I suppose, you'll tell me, is a Martian." Most celebrated flying saucer "spotter" to date in Paris is film star Michele Morgan, who reported seeing one near the Eiffel tower at about 10 p.m.
"You lost a good opportunity that night to hold your tongue." Offer of 10 million francs (1000000) to any one who brings me a live inhabitant of planet Mars. Contact PRE in LOCRONAN (Finistère). On the night of September 10, near Quarouble in Northern France, an oblong machine about 10 feet long landed on a railroad track a few yards from the house of farmer Marius Dewilde. Two small man-like creatures emerged, dressed in costumes that looked like divers' suits. As Mr. Dewilde walked towards the machine, he was paralyzed by a green light. By the time he recovered, the machine was high in the sky. Further investigations showed symmetrical scrapes on the wooden railroad ties, suggesting that the object had rested on a tripod undercarriage. The same evening a farmer named Antoine Mazaud of the Plateau of Millevache in Southern France turned in a similar report to the local authorities. Walking home, Mr. Mazaud had found himself suddenly face to face with a small, mysterious stranger, wearing something that looked like a crash helmet. Farmer Mazaud prudently extended his pitchfork. The stranger, on the contrary, held out his hands in a gesture of friendship, walked up, uttered a few sounds, and kissed Mr. Mazaud on the cheek. Before the farmer could recover his poise, the amiable intruder has climbed the roadside hedge and entered a cigar-shaped contraption which took off with a faint buzzing sound. The article below was published in Time magazine, USA, for October 25, 1954. One morning last October, Jean Narcy, a road mender of Haute-Marne, France, was riding to work on his bicycle. In a wheat field he saw a little whiskered man just under 4 ft tall, who wore a fur coat, an orange corset and a plush cap. "Bonjour, [Hello]" said Mr. Narcy. The little man muttered something like "I'll be seeing you." Then he jumped into a small (10 ft. in diameter) flying saucer, took off with a buzzing sound and disappeared into the clouds. With Narcy's "Hairy Martian" as a starting point, the French press run wild, and a deluge of Martians have been raining down ever since. They have come in flying cigars, crowns, comets, winged mushrooms, even a flying chamber pot. Unlike Americans who have seen flying saucers, the French "sighters" paid little attention to the vehicles. They were interested in the people from space. The Martians were anything but standardized. One who stopped Mr. Roger Barrault near the town of Lavoux had brilliant eyes, an enormous moustache, wore rubbers and spoke Latin. Another asked Mr. Pierre Lucas, a Breton baker, for a light. He was bearded and had a single eye in the middle of the forehead. Mr. Lucas could not remember what language he spoke. Paralysing Pygmies. As the Martian invasion of France proceeded, the invaders became more bizarre. A troup of pygmies in plastic helmet gamboled down a railroad track near Quarouble and transfixed Mr. Dewilde with "a paralyzing beam of light." Some Martians were blue, others were yellow or pink. A traveling salesman of the Côte du Nord saw a wonderful sight: a deep rose flying cigar from which stepped a zebra-stripped Martian. As he alighted, he changed color, chameleon-like, from yellow to green. The Martians marched en masse into French affairs. Cartoonists welcomed them delightedly (see cuts). As they multiplied, they even gained respectability. Le Figaro reported: "Counsellor General of Alpes Maritimes greets flying saucers' first appearance on the Côte d'Azur." France Soir announced that "a daily flying-saucer service seems to have been established between Marais-Poitevin and La Rochelle." 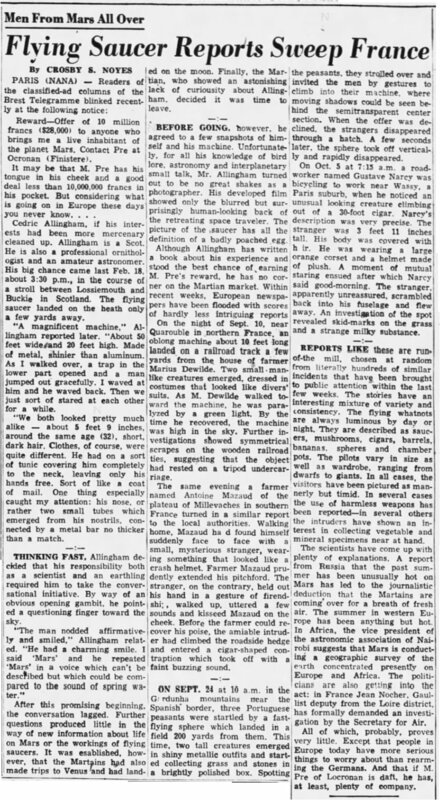 A man from space even made the social columns of Paris-France: "Mustached Martian spends weekend at Vienna." Angry deputies asked questions in Parliament. Air Force Authorities (even as in the US) were badgered for explanations. Before the many-colored Martians rained down on France, fames Swiss Psychiatrist C. G. Jung was asked what he thought about the saucer epidemic. "Something is being seen," said Jung. "What is seen may be, in the case of a single observer, a subjective vision (hallucination). In the case of many observers, it may be a collective vision. such a psychic phenomenon... could be a spontaneous reaction of the subconscious to the present conscious situation; the fear of an apparently insoluble political situation in the world... At such times eyes turn heavenwards ... and miraculous forebodings of a threatening or consoling nature appear from on high." No More Dreams. Dr. Jung blames the U.S. air Force for mishandling the saucer epidemic and for permitting irresponsible journalists to pump it for bits of sensational-sounding information. He does not believe that the saucers are space ships. Those that are not hallucinations, he thinks, are probably misinterpretations of physical objects or effects. But he was willing to speculate about the effect on the human race of an invasion by beings from another world. Our sciences and technology would go to the junk pile. What such a catastrophe would mean morally we can gauge by the pitiful decline of the primitive cultures that takes place before our eyes. The capacity to manufacture (interplanetary space ships) points to a technology towering sky sky high over ours." "Just as the Pax Britannica made an end to the tribal warfare in Africa, so our world could roll up its Iron Curtain and use it for scrap ... This might not be so bad. But we would have been 'discovered' and colonized." Reward - Offer of 10 milions francs ($28.000) to anyone who brings me a live inhabitant of the planet Mars. Contact Pre at Locronan (Finistere). Cedric Allingham, in his interest had been more mercenary cleaned up. Allingham is a Scots. He is also a professional ornithologist and an amateur astronomer. His big chance came last Feb. 18, about 3:30 p.m., in the course of a stroll between Lossiemouth and Buckle in Scotland. The flying saucer landed on the heath only a few yards away. "A magnificent machine," Allingham reported later. "About 50 feet wide and 20 feet high. Made of metal, shinier than aluminum. As I walked over, a trap in the lower part opened and a man jumped out gracefully. I waved at him and he waved back. Then we just sort of stared at each other for a while. "We both looked pretty much alike - about 5 feet 8 inches, around the same age (32), short, dark hair. Clothes, of course, were quite different. He had on a sort of tunic covering him completely to the neck, leaving only his hands free. One thing especially caught my attention: his nose, or rather two small tubes which emerged from his nostrils, connected by a metal bar no thicker than a match. THINKING FAST, Allingham decided that his responsibility both as a scientist and an earthling required him to take the conversation initiative. By way of an obvious opening gambit, he pointed a questioning finger toward the sky. "The man nodded affirmatively and smiled," Allingham related. "He had a charming smile. I said 'Mars' and he repeated 'Mars' in a voice which can't be described but could be compared to the sound of spring water." After this promising beginning, the conversation lagged. Further questions produced little in the way of new information about life on Mars or the working of flying saucers. It was established, however, that the Martians had also made trips to Venus and had landed on the moon. Finally, the Martian, who showed an astonishing lack of curiosity about Allingham, decided it was time to leave. BEFORE GOING, however, he agreed to a few snapshots of himself and his machine. Unfortunately, for all his knowledge of bird lore, astronomy and interplanetary small talk, Mr. Allingham turned out to be no great shakes as a photographer. His developed film showed only the blurred but surprisingly human-looking back of the retreating space traveler. The picture of the saucer has all the definition of a badly poached egg. Although Allingham has written a book about his experience and stood the best chance of earning Mr. Pre's reward, he has no corner on the Martian market. Within recent weeks, European newspapers have been flooded with scores of hardly less intriguing reports. On the night of Sept. 10, near Quarouble in northern France, an oblong machine about 10 feet long landed on a railroad track a few yards from the house of a farmer Marius Dewilde. Two small man-like creature emerged, dressed in costumes that looked like divers' suits. As M. Dewilde walked toward the machine, he was paralyzed by a green light. By the time he recovered, the machine was high in the sky. Further investigation showed symmetrical scrapes on the wooden railroad ties, suggesting that the object had rested on a tripod undercarriage. The same evening a farmer named Antoine Mazaud of the plateau of Millevaches in southern France turned in a similar report to the local authorities. Walking home, Mazaud had found himself suddenly face to face with a small, mysterious stranger, wearing something that looked like a crash helmet. Farmer Mazaud prudently extended his pitchfork. The stranger, on the contrary, held out his hand in a gesture of friendship, walked up, uttered a few sounds and kissed Mazaud on the cheek. Before the farmer could recover his poise, the amiable intruder had climbed the roadside hedge and entered a cigar-shaped contraption which took off with a faint buzzing sound. ON SEPT. 24 at 10 a.m. in the Gardunha mountains near the Spanish border, three Portuguese peasants were startled by a fast-flying sphere which landed in a field 200 yards from them. This time, two tall creatures emerged in shiny metallic outfits and started collecting grass and stones in a brightly polished box. Spotting the peasants, they strolled over and invited the men by gestures to climb into their machine, where moving shadows could be seen behind the semitransparent center section. When the offer was declined, the strangers disappeared through a hatch. A few seconds later, the sphere took off vertically and rapidly disappeared. On Oct. 8 at 7:15 a.m., a roadmender named Gustave Narcy was bicycling to work near Wassy, a Paris suburb, when he noticed an unusual looking creature climbing out of a 30-foot cigar. Narcy's description was very precise. The stranger was 3 feet 11 inches tall. His body was covered with hair. He was wearing a large orange corset and a helmet made of plush. A moment of mutual staring ensued after which Narcy said good-morning. The stranger apparently unreassured, scrambled back into his fuselage and flew away. An investigation on the spot revealed skid-marks on the grass and a strange milky substance. REPORTS LIKE these are run-of-the mill, chosen at random from literally gundreds of similar incidents that have been brought to the public attention within the last two weeks. The stories have an interesting mixture of variety and consistency. The flying whatnots are always luminous by day or night. They are described as saucers, mushrooms, cigars, barrels, bananas, spheres and chamber pots. The pilots vary in size as well as wardrobe, ranging from dwarfs to giants. In all cases, the visitors have been pictured as mannerly but timid. In several cases the use of harmless weapons has been reported - in several others the intruders have shown an interest in collecting vegetable and mineral specimen near at hand. The scientists have come up with plenty of explanations. A report from Russia that the past summer has been unusually hot on Mars has led to the journalistic deduction that the Martians are coming over for a breath of fresh air. The summer in western Europe has been anything but hot. In Africa, the vice president of the astronomic association of Nairobi suggests that Mars is conducting a geographic survey of the earth concentrated presently on Europe and Africa. The politicians are also getting nto the act: in France, Jean Nocher, Gaullist deputy from the Loire district, has formally demanded an investigation by the Secretary for Air. All of which, probably, proves very little. Except that people in Europe today have more serious things to worry about than rearming the Germans. And that if M. Pre of Locronan is daft, he has, at least, plenty of company. PARIS -- (INS) -- Italy's mysterious "flying cigar" is the latest of many strange objects seen and reported throughout Europe in recent months. Earlier this summer, Norway had reports of "interplanetary" visitors spotted in the country. They were reported as "long-haired creatures," apparently harmless. A much more specific case of unwordly visitors, however, curretly is intruiguing France. It involves weird, three-foot-high midgets who supposedly paralyzed a French worker with a ray gun when he saw them. The story, under investigation by police, was told by Marius Dewilde, 34, a metalurgy worker in Lille. His friendsvouch for him as a "clear-headed, solid citizen." "It was about 9:30 p.m. I was sitting in the kitchen reading. In the backyard, Kiki, my dog started barking so loud that I went out to see what was wrong. "I noticed on the railroad tracks a few yards on my left, a dark-colored form, but I thought it was only a cart some farmer left near the tracks. "Then to my right, I heard footsteps. I turned on my flashlight. Then I saw two things. "The one marching ahead turned to look at me and my flashlight picked up a metallic reflection from his head. I had the distinct impression he had his face covered with a kind of deep-sea divers's helmet. "THEY WERE very small - only about three feet hight, but very wide-shouldered and the helmet over the head seemed enormous to me. "After the first few seconds of amazement, I ran toward the garden gate to cut them off. At that moment, a square opened in the dark form. "A projector was aimed at me, giving an intense light with green reflections. Its beam paralyzed me. I wanted to shout, but I couldn't. My legs wouldn't obey me. "Finally, I found control of my muscles and started toward the dark form. But already, it was taking off the ground." "I saw a flying saucer and two of his passengers, told me Marius Dewilde, saw it with my eyes, like I see you. Do not believe me if you want, I will always maintain what I say. Feel free with you to doubt my mental faculties. But do not make me say that I saw Martians, that I do not know at all! The man who tells me this is a young metallurgist of thirty-four years, known by all as a vigorous worker, perfectly calm and with the ideas well in place. The place of our conversation is Quarouble, a small industrial village of the area of the French border, located on the road of Valenciennes, a few kilometres from Quiévrain. Le dessin malhabile du témoin. Dans le coin gauche, sa maison précédée d'une cour entourée de lattis. Les deux êtres (les deux points) se trouvaient à droite de la cour au momen où M. Dewilde les vit. La soucoupe était d'abord posée sur les rails représentés par les deux traits parallèles longent la maison. Elle s'éleva verticalement en dégageant de la fumée et disparut à l'horizon sous la forme d'une boule de feu. Dans le coin droit, un des passagers de l'engin. tel qu'il se présenta aux yeux du témoin. The clumsy drawing of the witness. In the left corner, his house preceded by a court surrounded by lathing. The two beings (two spots) were on the right of the court when Mr. Dewilde saw them. The saucer was initially posed on the railway tracks represented by the two parallel lines skirting the house. It rose vertically while releasing smoke and disappeared at the horizon in the form from a ball of fire. In the right corner, one of the passengers of the machine such as it looked according to the witness. [Photo caption:] Since his adventure, Mr. Marius Dewilde receives a bulky mail. [Photo caption:] The small house in front of which the mysterious machine of the air came to land. Photo caption: "Mr Marius Dewilde draws for the investigators the saucer and its occupants as he saw them." SAUCER SCRATCHES on railroad tie were circled in chalk by Marius Dewilde of Quarouble who carries the tie home to preserve proof of the rust-colored flying contraption he saw land on tracks. But most of the tales were from France. In Quarouble, near Lille, on the night of September 10, Marius Dewilde went outdoors to see what his dogs were barking at. There, parked on the railyway at the bottom of his garden, was a 10 ft. oblong machine that looked like a cheese dish cover. Before Dewilde could make some appropriate explamation, as Frenchmen are supposed to do, he spotted three small creatures about three ft. tall, walking along the track! The little men didn't have any arms, but they had "enormous shoulders, and were wearing vast divers' helmets." Dewilde must have been a fearless Frenchman, for he decided to take after the little men. A Green light shot from the saucer, paralyzing him, and the next thing he knew the thing was rising from the railway, hissing and emitting black smoke. Police didn't believe the 34-year-old steelworker, but weren't so sure after they noticed scorched stones and strange markings on the railway, which suggested something with a tripod undercarriage had rested there. On September 10, 1954, in Quarouble (North), a metal-worker, Marius Dewilde, is in the presence of two small beings "wearing suits similar to those of divers. They were of very small size: not more than one meter... I saw their legs, On the other hand, I dis not see their arms and I am not sure that they had any arms." On the the railway, near Marius Dewilde's house, the investigators found marks which, according to experts, were pressed in by a machine of about thirty tons. Michel Carrouges indicates that the Dewilde observation was made at a distance of 6 meters. Michel Carrouges indicates that in the case Dewilde the precise details provided on the topography of the places and the respective localisation of the witnesses and the objects or the pilots enforced the extreme closeness of the encounter. Aimé Michel: Flying Saucers and the Straight Line Mystery, p. 44. "Three investigators for the air police arrived at Quarouble, Nord, yesterday to interrogate M. Marius Dewilde, the man who saw two "Martians" near his back-yard gate. They left the village with the assurance that during the night of Friday to Saturday, a mysterious craft had indeed landed, as claimed by M. Dewilde, on the railroad tracks of the line Saint-Amand-Blanc-Misseron, near the railroad crossing No. 79." "Their inquiries seem, in effect, to confirm the statement made by the metal worker. The witness has declared that Friday, about 10:30 P.M., he had seen a machine of an elongated shape, three meters high, six meters long, sitting on the tracks a few meters away from his house. Two entities of human appearance, of very small height and apparently wearing diving suits, could be seen nearby. M. Dewilde walked toward them, but at this moment a beam of greenish light was focused on him from the craft and he found himself paralyzed. When he was able to move again the machine had started to rise and the two entities had disappeared." "The investigators have found no trace of the existence of these entities. The ground, examined meter by meter, does not show traces of footsteps. However, one of the sleepers on the tracks showed traces that could have been made by a machine landing on it. In five places the wood of the sleepers is tapped on a surface of about four square centimeters. These markings have all the same appearance and they lie symmetrically, on one line. Three of them-those in the middle-are separated by an interval of forty-three centimeters. The last two are sixty-seven centimeters away from the preceding ones." "A craft that would land on legs instead of wheels like our own aircraft would not leave other traces, one of the inspectors of the air police has declared." "The narrative made by M. Dewilde is also confirmed by several inhabitants of the region. In Onnaing, a young man called Mr. Edmond Auverlot and a retired man, M. Hublard, have seen about 10:30 p.m.. (the time indicated by M. Dewilde) a reddish light traveling in the sky. The same light has been seen from Vicq by three young men." Jacques Vallée says that the railroad specialists consulted by the investigators in respect of the markings on the wooden ties calculated that the pressure indicated by the prints corresponded to a weight of thirty ton. These marks were fresh and sharply cut, showing that the wood or the ties had been subjected at those five points to very heavy pressure. Jacques Vallée says that according to Aimé Michel's book Mystérieux Objets Célestes, and its English version Flying Saucers and the Straight-Line Mystery, in an examination of the gravel of the roadbed, the policemen found another puzzling fact: At the site of the alleged landing the stones were brittle, as if they had been calcined at high temperature (115) Some blackish traces were also found. Although nothing was determined about the existence of the "operators," it was said in the report that the ground was hard and that the absence of footprints did not disprove the story. There have been many such cases; one of the more notable occurred in France, near Valenciennes, in September 1954. Marius Dewilde was 34 years old, married, the father of a family. He was a metal worker in the Blanc-Misseron steel mills on the Belgian frontier. He had the reputation of being a reliable man at his job, a good worker, certainly not a visionary. At the time he lived with his family in a little house isolated in the midst of woods and fields, about a mile from the village of Quarouble. In front of the house there is a small fenced garden. Alongside this garden runs the National Coal Mines railway track from St. Amand-les-Eaux to Blanc-Misseron, and grade crossing No. 79 is next to the house. This is M. Dewilde's story taken down by an investigator: 'My wife and son had just gone to bed, and I was reading by the fire. The clock over the kitchen stove said 10.30 p.m., when my attention was attracted by my dog Kiki's barking. The animal was howling loud enough to wake the dead. Thinking there must be a prowler in my yard, I took my flashlight and went out. 'When I got to the garden, I noticed on the railroad track, less than six yards from my door, on the left, a sort of dark mass. Some farmer left his cart there, I thought at first, I'll have to tell the station men first thing in the morning to take it away, or we'll have an accident. Farmers do sometimes use the railbed as a road during the harvest, because in that marshy country the motor roads are in poor condition. 'Just then', M. Dewilde went on, 'my dog came up to me, crawling on her belly, and all at once I heard hurried footsteps on my right. There is a path there that we call the 'smugglers path', for they sometimes use it at night. Kiki turned towards the sound and started barking again. I turned on my flashlight and directed its beam toward the path. 'What I saw had nothing to do with smugglers. Two creatures such as I had never seen before were not more than three or four yards away from me, right behind the fence, the only thing that separated us, walking along one behind the other toward the dark mass that I had noticed on the track. 'The one in front turned around toward me. The beam of my light caught a reflection from glass or metal where his face should have been; I had the distinct impression that his head was enclosed in a diver's helmet. In fact, both creatures were dressed in one-piece outfits like the suits that divers wear. They were very short, probably less than three and-a-half feet tall, but very wide in the shoulders, and the helmets protecting their 'heads' looked enormous. I could see their legs, small in proportion to their height, it seemed to me, but on the other hand I couldn't see any arms. I don't know whether they had any. 'When the first seconds of stunned amazement had passed, I rushed towards the garden gate, intending to go around the back of the fence and cut them off from the path, to try to get hold of at least one of them. 'I was no more than six feet from the two forms when I was blinded by an extremely powerful light, like a magnesium flare, coming through a sort of square opening in the dark mass on the tracks. I closed my eyes and tried to yell, but I couldn't, it was just as if I had been paralysed, I tried to move, but my legs wouldn't obey me. 'Feeling that I was going crazy, I heard, as if in a dream, a yard away from me, the sounds of steps on the cement block that stands in front of the gate to my garden. The two creatures were going toward the railroad. 'Finally the beam of light went out. I then recovered the use of my muscles and ran toward the track. But the dark mass that had been standing there was rising from the ground and hovering lightly, like a helicopter. I had been able, however, to see a kind of door closing. A thick dark steam was coming out the bottom with a low whistling sound. The craft went up vertically for about a hundred feet and then, still gaining altitude, turned toward the east in the direction of Anzin. When it was some distance away it took on a reddish luminosity. A minute later it had disappeared completely'. When he had partly regained his senses, M. Dewilde went and woke his wife, then called a neighbour. Then he ran to the nearest police station, in the little village of Onnaing, about a mile away. He was so agitated and his speech seemed so confused that the police took him for a lunatic and dismissed him. Then he ran to the police commissioner's office and succeeded in winning Commissioner Gouchet's attention. Realising at once that something extraordinary had happened, the commissioner dismissed without hesitation any notion of a joke or a hoax. M. Dewilde's fear was too unmistakable. Commissioner Gouchet's report set off a triple enquiry, conducted jointly by the regular police, air police, and the Department of Territorial Security, also somewhat similar to the American F.B.I. The following morning these three organisations took down M. Dewilde's deposition once more. They came to the same conclusion as Commissioner Gouchet and discarded any idea that the story was a deliberate invention. Then they returned to the spot on Monday, 13 September, to try to explain the phenomenon itself. The first hypothesis they considered was that of a clandestine helicopter carrying contraband. But this explanation had to be abandoned; telegraph wires would have prevented any landing in that spot. Then the three enquirers looked for any traces and for further witnesses. They first examined, foot by foot, the land adjoining the railway tracks, where the two supposed creatures might have left footprints. They found nothing that might have confirmed M. Dewilde's story. But they said in their report that the ground was hard and the absence of footprints did not disprove the story. They found their search along the railroad track more productive. In five places on three of the wooden ties were identical depressions, each about an inch-and-a-half square. These marks were fresh and sharply cut, revealing that the wood of the ties had been subjected at those five points to heavy pressure, as if they had supported a very heavy weight. Furthermore, the marks were symmetrically placed. Three were in a row in the middle, all on the same tie, and about 18 inches apart. The other two were on either side of the line formed by these three, and were about 28 inches away from it. Questioned by reporters about these imprints, one of the air policemen working on the investigation replied: 'A machine that landed on feet instead of on wheels like our own craft would leave prints exactly like them'. To explain these prints it was first suggested that they might have been left by workmen screwing on track bolts. But no work of that sort had been done for a long time, and the prints were freshly made. Neither then could it account for the prints' geometrical arrangement. The railroad engineers, when consulted by the investigators, said they had calculated that the pressure revealed by the prints corresponded to a weight of thirty tons. Later some 25ft of track was removed for more stringent analysis. Also, closer examination at the site of the alleged landing revealed that some of the ballast between the lines had been subjected to extremely high temperature. The stones were brittle and calcined. We may now ask, who among us is going to suggest that a humble man could go to these extraordinary lengths to perpetrate such a hoax, or even that this was a case of misinterpreted natural phenomena? If there are those who think the flying saucer explanation is untenable, then, equally, I for one find the above alternatives positively amusing! There are many similar cases where ground effects were left by saucers, therefore we can conclude that such craft are real, solid contraptions, whatever their modus operandi in space may be. Sep. 10, 1954, 10:30 P.M., Quarouble (France). September 10, 1954, Quarouble, France. The witness first came upon a UFO that landed on railroad tracks, then encountered creatures "such as I had never seen before. ... The beam of my (flash) light caught a reflection of glass or metal where his face should have been. I had the distinct impression that his head was enclosed in a diver's helmet ... They were very short, probably less than three and a half feet tall." September 10, 1954, Nord, France. A metalworker came out of his house to see a dark object parked on the railroad tracks, and two little men were running toward it. When the observer tried to chase them, they shot back a beam of light that "paralyzed" him; then their craft shot into the sky. The author indicates that on September 10, 1954 in Quarouble in the Nord, a workman on metal left his house because the dog barked and he saw a dark object on the railway. He thought that it was a car. Then he noticed two small beings advancing towards him, tried to stop them, but was paralysed when a strong light was projected on him. The object flew away. 35. Encounter at Quarouble (Nord), September 10, by Marius Dewilde: l'Aurore, September 13; Lille Nord-Eclair, September 16; Reuters, September 13, &c., and INS, September 16, lc., in many U.S. newspapers; Life , op . cit. ; Time, op. cit. ; Michel, op. cit., pp. 44-48. From Italy, let us now go to France where, in this same year 1952, fertile of extraterrestrial appearances, a farmer is the subject of a strange aggression. On September 10, at 10:30 p.m., Marius Dewilde, who lives Quarouble, in the department of Nord, hears his dog howl to the death. He comes out armed with his rifle, thinking he would fall on a smuggler (the Belgian border is very close), and sees on the railway track near his farm a dark mass which he mistakes for a cart. His attention is caught by noises of footsteps along his palisade. Lighting his flashlight, he sees two small humanoids with enormous heads. When he directs the lamp on the face of the one of them, it has, Mr. Dewilde states, like a reflection of glass or metal. The witness specifies that he clearly had the impression that it was a diving-suit helmet. The "beings" are less than one meter tall, but have very broad shoulders. Their legs are proportioned with their size, but the witness is unaware of arms. Mr. Dewilde wants to bar the passage to them to try to catch one of these creatures, but, arrived at approximately two meters of them, an extremely powerful illumination, like a magnesium flash, spouts out of the object and blinds the witness. He wants to shout, but feels paralysed. During this time, the small beings hasten to reach their craft. At the end of a few minutes, Mr. Dewilde recovers all his forces. He looks up towards the sky and sees the craft then slipping by at sharp pace towards the horizon, leaving a thick dark vapor behind. In his chapter on the cases of paralysis or drousiness of UFO witnesses during their experience, Pierre Delval indicates 12 cases from the French flap of 1954, among those, that in Quarouble in the department of the Nord on September 10, 1954 at 10:30 p.m.
Marius Dewilde, metal-worker, aged 34, was alerted by the barkings of his dog, and left his house. He noticed but without paying attention to it a dark form which stationed on the railway within a few tens of meters of him. His attention was then drawn to two being of approximately 1 meter in height, dressed in diving-suits, which walked on the path. Marius Dewilde rushed towards his garden's door to cut the road to the small beings and to capture one of them if possible. When he was hardly within two meters of them, from a square opening of the black mass that Dewilde had taken for a cart, an illumination with green reflections spouted out, as sharp as magnesium combustion, amd dazzled him. He instinctively closed his eyes and wanted to shout but could not do this, being like "paralysed." He tried to move, but his legs refused to obey. He was thrown into a panic, and heard as in a dream, a footsteps noise on the cement flagstone in front of his door. He supposed that both anthropoids moved towards the UFO. Suddenly, he recovered the use of his members and the control of his muscles, he managed to reopen his eyes and noted that the projector was extinct. He then rushed towards the railway, but the dark mass had already disappeared. The American ufologist indicates that on September 10, 1954, in France, in Quarouble, Marius Dewilde, metal-worker, heard a dog bark, left his house, and saw a black object on the railway, and two small beings which moved towards him. Having tried to stop them, he was paralysed by a ray of an intense orange color. The creatures were small, less than one meter in height, broad, and wore "diving suits." He indicates that this example of case of a close encounter of the third kind comes from the catalogue by Jacques Vallée who extracted it from the Aime Michel's book. The authors indicate that on September 10, 1954 in Quarouble in the department of North, close to the Belgian border, Mr. Dewilde, guard of a level crossing, heard towards 10:30 p.m. his dog howl madly. He thought that there were poachers in ramble, took his flashlight and came out to inspect the premises. He distinguished a "large dark mass posed on the railway, and heard a noise of steps in the path which skirts his garden. He directed his lamp in this direction and saw two beings "like I had never seen" which approached while being within a few meters him, and two others a little farther. The beings seemed dressed of divers suits and capped with helmets that wrapped all the head. When he rushed to bar the way to them, a blinding light came out from the machine on the railway and paralysed him. When this projector died out a few moments later and he recovered the use of his members, he saw the machine rising while swinging like a helicopter, producing a gentle whistling sound, with a thick vapor spouting out by its lower part. The machine took a reddish colouring and disappeared. Because of the proximity of the border, there was a series of investigations. The press grabbed the story, which did much fuss at the time. One of the arguments which had then appeared convincing was deep prints in the hard wood of the cross-pieces of the railroad, which made it possible to estimate as about thirty tons the pressure which had been exerted. The authors indicate as sources an investigation by Marc Thiroin in the Files of the AAMT, Mr. Carrouges in "Les apparitions de Martiens" and J. Guieu in " Black out sur les S.V. ", and among the Press: Le Parisian Libéré for September the 13, and 14, 1954. The investigation was carried out by Marc Thiroin for the ufologic movement, but also, let us not forget it, by the police and railway authorities. The conclusions remained secret; even J.-C. Bourret could not obtain the authorization to read it when he wrote his ufology book. If there were only hot air in this official report, be sure that it would have been given to the medias for a long time! For more certainty, I thus wrote to Mr. Bigorne, who lives in the area, for his qualities of investigator are recognized by all (not only by LDLN, but already by the formerly GEPA); here his answer. "... since 1970, I went several times on location and practically found all the material details cited in the accounts of that time..."
"The change of attitude of Dewilde in these last years does not influence the events of 1954." Here is the language of the common sense seems to me. So why it is that today, 20 or 30 years after the events, any individual, acting on a purely personal basis or in the capacity of "president" of some unknown groupuscule grants himself the right to call anything in question. Living in the other end of France and being unaware of the entire locations, of the people of the time and perhaps of the master pieces of the file, how can anyone allow himself to throw suspicion on any case which is not his competence? In this precise case, it is precisely the current attitude of the witness, Marius Dewilde, who inspires to him these doubts. This is a total lack of understanding of ANYTHING in the psychological aspect of the UFO problem! I repeat the sentence of Mr. Bigorne who seems essential to me: "the change of attitude of Dewilde in these last years does not influence the events of 1954," I add that it is the same for Micheline G. in the previous case! Jacques Vallée indicates that on September 10, 1954, at about 10:30 p.m. in Quarouble, a small French village near the Belgian border, Marius Dewilde stepped outside and was at once intrigued by a dark mass on the railroad tracks. He then heard footsteps, he turned on his light and faced two beings wearing very large helmets and what seemed to be heavy diving suits. He did not see their arms, they had broad shoulders, they were less than 4 feet tall. He moved toward them to intercept them but a light appeared on the side of the dark mass on the track and he found he could not move. When he had regained control of his body, the two beings had entered the supposed machine and flown away. "The official body working in liaison with the Air Police belongs to the Ministry of National Defense. The very name of this Ministry excludes the idea of any communication". Vallée then discusses of Dewilde's next sighting report. 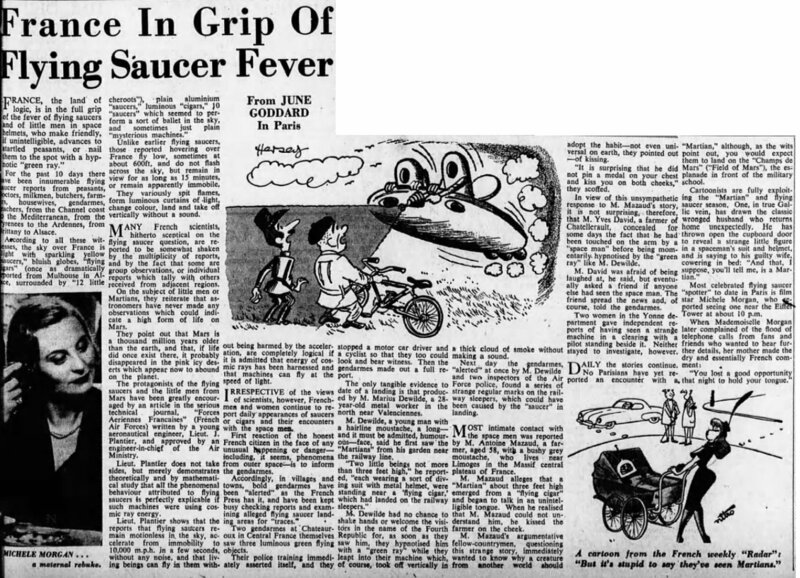 My interest in "flying saucers" goes back to the Fall of 1954 when there was a deluge of sightings in France, and indeed throughout Europe, from England to Italy. Every day the front page of all the newspapers, from L'Aurore to France-Soir, carried big headlines and surprising claims which the radio amplified with commentaries and on-the-air interviews. My father, a respected magistrate, a former investigative Judge who had been promoted to Paris as a Justice of the Court of Appeals, would scoff at such reports: in his profession, he pointed out, he had become leery of the weakness of human testimony. Especially that of experts. As a kid I remember hearing one of the earliest French witnesses, a railroad worker named Marius Dewilde, telling his story to radio broadcaster Jean Nohain in a live interview on the evening news: "I had gone out to piss ..." he bluntly told the whole nation. He had seen two little robots next to a dark machine resting on the nearby railroad tracks. The air police found traces of a large mass. A strange ray issued from the object and paralyzed Dewilde. I believed his story at the time. I still do. During the three months the wave lasted I carefully gathered such clippings and glued them into a fat copybook. September 10th. Two hours later at Quarouble. 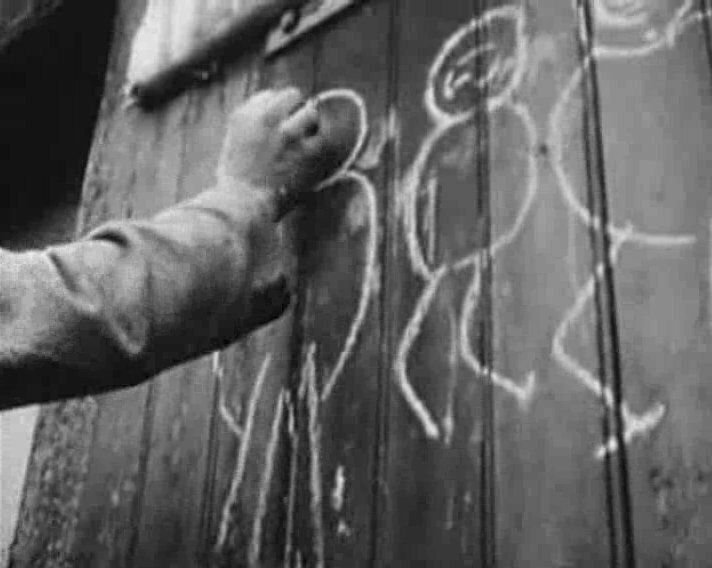 At approximately 10:30 the evening of September 10, 1954 a metal worker by the name of Marius Dewilde who lived in Quarouble, a village close to the Belgian border, was drawn to a window in the rear of his home because his dog Kiki was .howling loud enough to awaken the dead. "Just then my dog came up to me, crawling on her belly, and all at once I heard hurried footsteps on my right. There is a path there that we call 'smugglers' path, for they sometimes use it at night. Kiki turned toward the sound and started barking again. I turned on my flashlight and directed its beam toward the path." 55. "What I saw nothing to do with smugglers. Two creatures such as I had never seen were walking along one behind the other toward the dark mass that I had noticed on the track...both creatures were dres'sed in one-piece outfits like the dress that divers wear. They were very short, probably less than three and half feet tall, but very wide in the shoulders, and the helmets protecting their 'heads' looked enormous. I could see their legs, small in proportion to their height, it seemed to me, but on the other hand I couldn't see any arms. I don't know whether they had any. ..I was no more than , six feet from the two forms when I was blinded by an extremely powerful light, like a magnesium flare...I closed my eyes and tried to yell, but I couldn't, it was just as if I had been paralyzed. I tried to move but my legs wouldn't obey me." 56. When the ray switched off, feeling returned to Dewilde's limbs. Meanwhile the creatures had left the area in their machine. The local police were immediately contacted by Dewilde who made such a bad impression at first by his fearfull, agitated state, that the lawmen were inc-lined to believe the fellow was crazy, but the police finally convinced themselves the story was worth checking and allowed the man to lead them to the spot of the supposed encounter, the Blanc-Misseron rail line that passed close to the rear of M. Dewilde's house. Examining the site police picked up some blacken stones that may have been affected by a rocket-like exhaust and noted five deep impressions on one of the wooden rail ties that seemed very fresh. It was suggested that actual physical evidence may exist to back up Dewilde's incredible story. 57. Dewilde draws the craft and its two occupants. La Voix du Nord 14 May 1968. p.1. Nord-France 17 September 54. pp.X.XI. "The official body working in liason with the Air Police belong to the Ministry of National Defense. The very name of this Ministry excludes the idea of any communication." 58. On the 13th M. Dewilde was questioned throughly for a second time by a joint task force, an interrogation method used by law enforcement to test the suspect's memory, the theory being that if a man is telling a lie, he will be hard pressed to remember the exact details of his original answers. M. Dewilde passed the test with flying colors. Barring a hoax, which authorities were now inclinded to do, the most rational possibility was some clandestine operation by a crime group, that perhaps a helicopter had landed at the spot that night and in the darkness Dewilde became frighten and confused. This idea was quickly abandoned however when an on-site survey was made, it was apparent there was no way a helicopter could have touched down due the maze of power lines in the area. 66. The French Air Police make a mistake? It would be hard to say that the French military was engaged in any socalled "UFO cover-up" similar to one often attributed to the U.S. Air Force by UFO buffs, if one uses the Dewilde investigation as any guide. 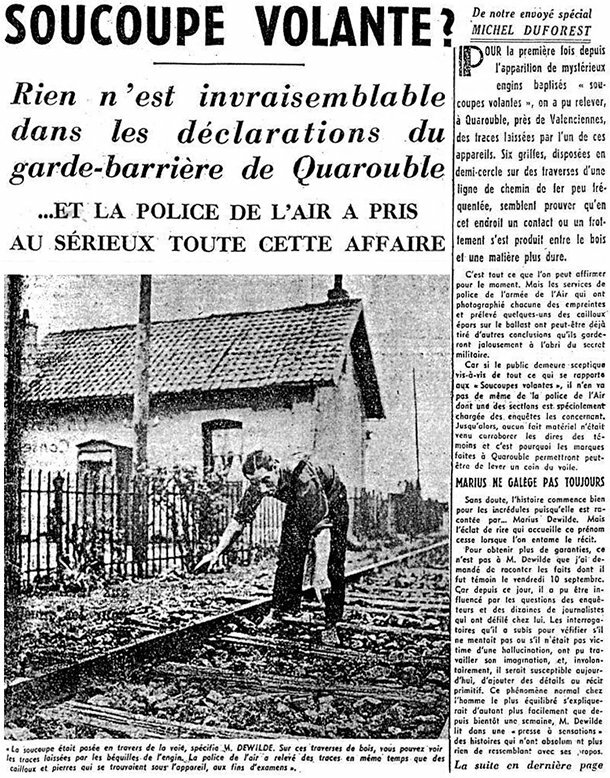 After the Air Police visited Quarouble on the 14th of September, interogating the witness and examining the area of rail crossing N.79 behind Dewilde's house, the military men could have refused comment, leaving people to speculate on Dewilde's sanity, but incredibly the officials seemed to have made little effort to play down the supposed incident or restrict the release of the results of their field investigation, freely talking to the press about how Dewilde's narrative seemed to have been confirmed by the checks being made. 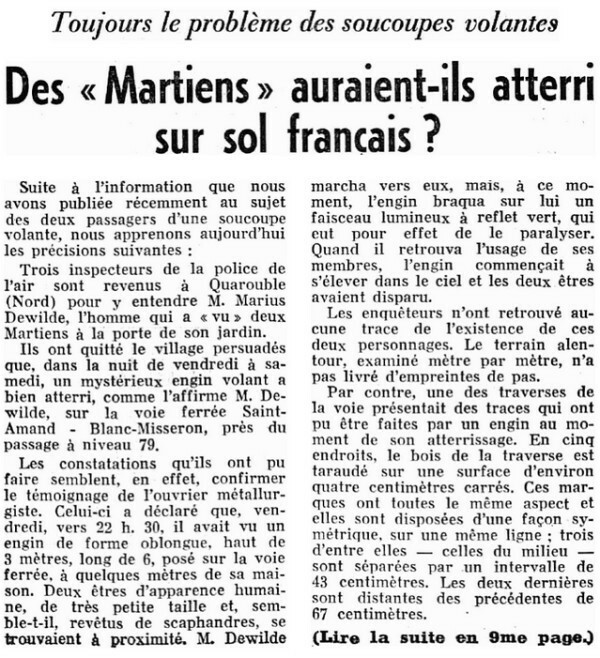 Indeed, the paper France-Soir reported on the Air Police investigation and called the supposed creatures "Martians" which is strong stuff when included in a news article featuring authorities. Scrutinizing the railroad tracks, the military investigators located no footprints and had to settle for an examination of the fresh indentations discovered on a railroad tie. The distance between the marks were carefully measured. Three were clustered in the middle some 43 centimeters apart, with two others 67 centimeters away to each side. One of the Air Police suggested "the strange machine reported by Dewilde landed on "legs" rather than wheels, thus making the marks on the wood. 71. There was no compelling reason to associate the marks with the UFO report and certainly no compelling reason to assume a machine landed there on "legs." The effect was to give an unofficial blessing to a lot of wild talk about "l'homme de l'espace." 55. Paris, France. France-Soir. 15 September 54. pp. 1,6. Also: Paris, France. Le Parisien Libere. 13 September 54. Also: Nord-Prance. 17 SeptemberT4T pp.X.XI. 58. Vallee, Jacques. Dimensions. New York, N.Y.: Ballantine Books 1988 p.23. 66. Michel, Aime. Flying "Saucers and the Straight-Line Mystery", p. 46. 71. Paris, France. France-Soir. 15 September 54. Also: Nord-Matin. 15 September 54. pp.1,6. At 10:30 p.m., Marius Dewilde, plant workman, living an old gate-keeper house, hears his dog howl. We are in Quarouble, in the department of Nord. He comes out and sees a large dark mass on the railway — the latter is not used for more than a few goods trains in direction of some local factories. He hears footsteps on the ballast, he turned over and saw two beings, one meter in height approximately, who walk with difficulty. They are dressed of a silver-colored outfit, and have a transparent helmet on the head, a little like divers. He wants to bar the road to them, but a beam of light comes out of the dark mass and paralyses him. The two characters pass at less than one meter of him, and reinstate the mysterious mass. It rises, swinging like a helicopter, with a slight whistling sound. A thick vapor spouts out under the craft. It takes height then moves towards the West, towards Anzin, by taking a reddish colouring. The Ari Forces, the police force, the DST, as well as private investigators, intervene on the spot. Traces are found on the railway. One considered the weight necessary to the realization of such traces, by a normal process, as 30 tons. One month later Marius Dewilde is the witness of another meeting, but this time by day. His young son also saw the scene. 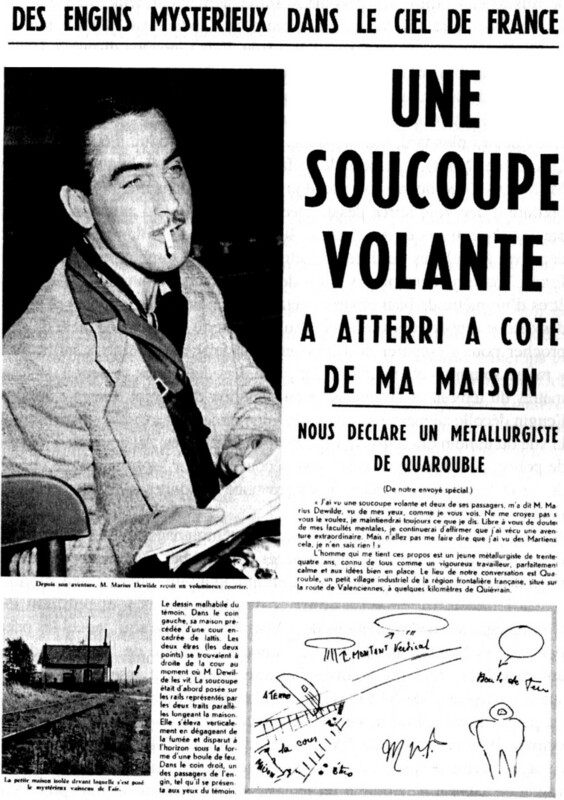 Dominique Caudron indicates that in Quarouble in the Nord on September 10, 1954, two "Martians" paralyse a metal-worker, and comments on - by irony - "'They' land! 'They' attack us!" The author says that on September 10, 1954, at 10:30 p.m. in Quarouble, France, Marius Dewilde was disturbed by his dog howling. Outside he saw two 3 feet - 1 meter - tall armless entities "shuffling along on very short legs". A beam of white-green light from a "shape" nearby paralyzed him. The entities entered the shape; which rose with a whistling noise and flew away to the east, glowing red. Ground markings were discovered later, and engineer calculated that a 30-tonne weight would have been necessary to make. Five other witnesses also saw the red light. Marcus Dewilde was walking his dog near the railroad tracks when he saw an object sitting on the track. He saw two small beings. When he tried to approach them a beam of light from the craft paralyzed him. He was unable to speak. With a loud whistling sound the craft flew away, leaving impressions on the ties. John Schuessler notes that the physiological effects were: "Paralysis, Mute, Sound, Ground trace"
The author indicates that on September 10, 1954 around 22 hours in Quarouble in the Nord, Marius Dewilde, gate-keeper, his dog barking to death, came out, saw a dark mass on the railway, heard footsteps and saw emerging within 4 meters two small individuals in diving-suits. He wanted to approach, a luminous ray spouted out of the mass and immobilized him, the hominians reached the craft which took off. The ray disappeared, Dewilde found the use of his muscles and immediately went by bicycle to the gendarmerie which was closed then to the police station of Onnaing. The police force, the gendarmerie of the air and the DST investigated. It was not a helicopter because of the proximity of power lines, on a cross-piece of the rails one found three symmetrical marks. The SNCF said that there was a pressure of 30 tons. The stones were crushed, like burned at high temperature. There was an identical observation and the same marks on October 10. The author indicates that there was an encounter with a landed UFO and alien beings in September 1954 in Quarouble, one of the most impressive examples of a UFO leaving landing traces on record, and that the events were described in the 15 September 1954 issue of France-Soir. Three investigators for the air police arrived at Quarouble Nord yesterday to interview M. Marius Dewilde, the man who saw two 'Martians' near his back-yard gate. They left the village convinced that, during the night of Friday to Saturday, a mysterious craft had indeed landed, as claimed by M. Dewilde, on the tracks of the Saint-Amand-Blanc-Misseron railway line, near crossing No. 79. Their inquiries seem, in effect, to confirm the statement made by the metal-worker. The witness declared that on Friday, about 10:30 p.m., he had seen a machine of an elongated shape, three metres high, six metres long, sitting on the tracks a few metres away from his house. Two beings of human appearance, of very small height and apparently wearing diving suits, could be seen nearby. Mr. Dewilde walked toward them, but at that moment a beam of greenish light was focused on him from the craft and he found himself paralysed. When he was able to move again the machine had started to rise and the two beings had disappeared. ...The ground, examined metre by metre, shows a trace of footsteps ...There are traces on the sleepers that could have been made by a machine landing on (them). In five places the wood of the sleepers is compressed over an area of about four square centimetres. These markings all have the same appearance and they lie symmetrically, on one line. Three of them - those in the middle are 43 centimetres apart. The last two are 67 centimetres away from the preceding ones. A craft landing on legs instead of wheels like our own aircraft would leave just such traces, one of the inspectors of the air police has declared. M. Dewilde's story is also confirmed by several inhabitants of the region. In Onnaing, at about 10.30 p.m. (the time indicated by M. Dewilde), a young man called M. Edmond Auverlot and a retired man, M. Hublard, saw a reddish light travelling in the sky. The same light was seen from Vicq by three young men. The air police concentrated their investigations on the markings found on the railway sleepers, and consulted several railway specialists, who concluded that an object exerting a pressure of thirty tons had been present. Examinations were also made of the gravel of the railway bed, which revealed calcination of the stones. They had become brittle, indicating the presence of intense heat, which had raised their temperature to just below melting point. Whatever had landed on the railway line had caused oxidation in the gravel. "Then, I heard like the very fast closing of a sliding door. Then the beam died out and, I at once recovered my senses..."
The author notes that when he was giving lecture in Tours or the surroundings, he knew Marius Dewilde very well, and he affirms that some time before his death, Marius Dewilde told him that the attacks he most suffered did not come from people who denied the UFO phenomenon but indeed from ufologists, including some who made much money at his expense. The authors indicate that Vallée reported a case for September 15, 1954 at Quarouble in France, in which Maurice Dewilde reported that at 10:30 p.m. he observed a three meters high elongated machine and six meters long resting on a railroad tracks a few meters of his house. Two small entities less than 4 feet tall, of human appearance, wearing "heavy diving suits" and helmets were seen nearby. A beam of greenish light came from the craft and paralyzed Dewilde when he approached. Marks that were left of the railroad crossties indicated the weight of the craft was in the order of 30 tons. These ufologists say that one of the best-known sightings of UFO occupants in France took place near Valenciennes on the night of September 10, 1954. It was such a strange incident that it received international press notice. Marius Dewilde, 34 years old at the time, was a metalworker in the Blanc-Misseron steel mills on the Belgian frontier, living with his family in a small home in the midst of fields and woods about a mile from Quarouble. His garden was adjacent to the National Coal Mines railway track running from Blanc-Misseron to St Armand-les Eaux, and grade crossing 79 was next to his house. On that night, he was reading after his wife and children had retired. At 10:30 p.m. he heard his dog Kiki barking, and thinking there was a prowler in the vicinity of his property, he took a flashlight and went outside. He walked to his garden, found nothing en route, then spotted a dark mass on the railroad tracks less than 6 yards from his door. He thought at first that someone had left a farm cart there. At that point his dog approached, crawling on her belly and whining, and simultaneously he heard hurried footsteps to the right of him. The dog began barking again and Dewilde directed his flashlight toward the sound of the footsteps. What Dewilde saw startled him greatly: less than 3 or 4 yards away, beyond the fence, were two creatures, walking in single file toward the dark mass at the tracks, both dressed in suits similar to those of divers, and light was reflected off glass or metal in the area of their heads. Both were small, less than 3.5 feet tall, but had very wide shoulders. The legs looked very short in proportion to the height of the little "men", and Dewilde could not make out any arms. After the first fright passed, Dewilde rushed to the gate, intending to cut them off from the path or to grapple with one of them. When he was about 6 feet from them, he was blinded by a very powerful light somewhat like a magnesium flare which came from a square opening in the dark mass on the tracks. He closed his eyes and tried to scream but couldn't, and he felt paralyzed. He tried to move but his legs would not function. Shortly, Dewilde heard the sound of steps at his garden gate, and the two creatures seemed to be going toward the railroad. The beam of light finally went out and he recovered the use of this legs and headed for the track. But the dark object had begun to rise, hovering lightly, and Dewilde saw a kind of door closing. A low whistling sound accompanied a thick dark steam which issued from the bottom of the object. The object ascended vertically till about 100 feet altitude, turned east, and when it was some distance away it took on a reddish glow. A minute later it was completely out of sight. After he regained his senses, Dewilde woke his wife and a neighbor, told them of this experience, then ran to the police station in the village of Onnaing, a mile distant. He was so upset and his speech so confused that the police thought he was a lunatic and dismissed him. From there he went to the office of the police commissioner where he told his story to Commissioner Gouchet. Dewilde's fear was so evident that Gouchet realized something extraordinary must have taken place, and the next morning his report brought investigators from the Air Police and the Department of Territorial Security. These teams, along with police investigators, questioned Dewilde and then examined the area where the dark object had rested. They found no footprints in the area, but the ground was very hard. However, they did find five places on three of the wooden ties which had identical impressions, each about 1.5 inches square. The marks were fresh and sharply cut, indicating that the wooden ties had been subjected to very great pressure at those five points. The impressions were never satisfactorily explained, but railroad engineers who were consulted by the investigators, calculated that the amount of pressure required to make the marks was approximately thirty tons. An examination of the gravel of the roadbed showed that at the site of the alleged landing the stones were brittle as if calcined at very high temperature. Lastly, several residents in the area reported that they had seen a reddish object or glow moving in the sky at about the time Dewilde indicated that the object had left. The authors give as reference their own books "Flying Saucer Occupants", Signet/NAL, 1967, and "Encounters with UFO Occupants", Berkley Medallion Books, 1976. Walking his dog along railroad tracks at night, Dewilde saw a dark mass. Also two small creatures with wide shoulders and huge helmets. He planned to approach, but a bright light from the craft paralyzed him. Creatures returned to craft, which took off with a loud whistling noise. Exam of rail bed showed depressions in rail ties where craft was reported. 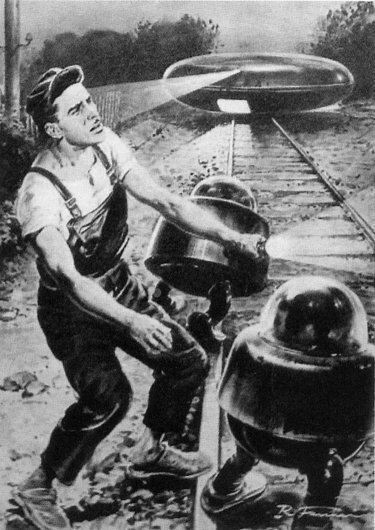 1954 - A metal worker, Marius Dewilde, age 34, came out of his house in Quarouble, France when his dog was barking and saw a dark object sitting on the railroad tracks. He then observed two dwarfs walking toward it. When he tried to stop them, he found himself paralyzed as a strong orange beam of light that was projected at him. The beings were under 1 meter (3.3 feet) tall, bulky, and wore dark diving suits. No faces or arms were visible. Imprints were made by an object, that an engineer estimated must have weighed 30 tons. French police and the French Air Force investigated the case. (Sources: Le Parisien, September 13, 1954; Aime Michel, Flying Saucers and the Straight Line Mystery, p. 44; Jacques Vallee, Passport to Magonia, p. 209). Hearing his dogs barking, Marius Dewilde went out and saw a dark mass on the railroad track, less than 6 yards away. On hearing footsteps, he turned his flashlight on the path, where he saw 2 very short beings (less than 3.5 ft) wearing "diver's suits." No arms could be seen. He approached within 6 ft, when he was blinded and paralyzed by a brilliant light emanating from the mass of the tracks. The two creatures went toward the object. When the beam of paralyzing light went out, he ran towards the track, but the object was now rising, emitting a "thick dark steam" and a low whistling sound. It became red luminous and flew away. On the railroad ties where found 5 imprints; it was calculated that a 30-ton weight would have been necessary to produce them. Recent information uncovered about the case indicates that Dewilde found after the craft took off a mysterious metallic black box. He took the box home and attempted to open it, without telling local police about it. After several failed attempts he finally gave up and hid the black box inside a carton. According to Dewilde shortly after this several French Air Force officers who somehow knew about the existence of the black box and took possession of it visited him. September 10, 1954 Marius Dewilde, Quarouble, France 10:30 P.M.
Two beings 3-1/2 ft. tall, coveralls, diver's helmet; dark mass on ground; dog howled, witness blinded by light from craft, paralyzed. Report 9/10/54 Quarouble, France, 2230: multiple witnesses, animal reaction, area heated to high temperature, imprints. 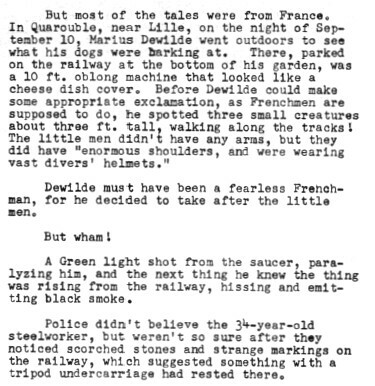 The Australian ufologist indicates that on 10 September 1954 at 2230 in Quarouble France, Marius DeWilde, aged 34, went outside and saw a dark mass was visible on railway tracks only 6m away. Two 1.3m tall creatures in one piece outfits were noticed. He approached these creatures and when only 2m away, was blinded by a brilliant light from the dark mass. he found himself paralysed. The beam of light went out, he could then move, and the object departed. He says it is one of the 15 cases in France in 1954 where there was a reported paralysis of the witness or witnesses when they were within a certain distance of a low-level UFO, distances that are 6m (1 case), 20m (2), 50m (2) 100m (1) and 150m (1). He adds that there seems little doubt about a relationship between the UFO and the paralysis, as the paralysis commenced upon observing the UFO and then ceased when the UFO left. 10:30 p.m.. Marius Dewilde (aged 34), metalurgy workman, leaves his house when hearing his dog bark and sees a dark object on the railway; he then observed two dwarves who walked towards him. When he tried to stop them, an intense orange light was projected on him, and at this time, he felt paralysed. The beings measured less than 1 m, were squat and carried dark diving-suits. Neither the faces nor the arms were visible. Technicians of the French Aviation and gendarmerie observed traces in the railway, which were calculated to have been caused by an object which weighed some 30 tons. The witness had a second encounter one month later. MAGONIA catalogue nº143 and 226 ? Nord-Eclair (Lille), September 16, 1954. Jacques Bonabot "Dossier Quarouble 1954" Bulletin Du GESAG, nº72 (June 1983) continued nº86 (December 1986) - 14 pages. Animal reaction-area heated to high temperature-dark mass on railroad tracks less than 6 yards away-two 3 ft beings. The witness approached to within 6 ft when he was blinded and paralyzed by a brilliant light from the dark mass.. The beings returned to the object, and it ascended with a low whistling sound, emitting a "thick dark steam," becoming red luminous, and flying away. On the railroad ties were 5 imprints. It was calculated that a 30-ton weight would have been necessary to produce them. The MD and ufologist indicates that on September 10, 1954, Marius Dewilde was paralyzed on the spot by green ray that spouted of a metallic craft on the way. He further adds that it was not on the head. On September 10 in Quarouble, a metal worker, Marius DeWilde, came out of his house as a dog was barking and saw a dark object on the railroad tracks, then saw two dwarfs walking toward it. When he tried to stop them, he was paralyzed by a strong orange light beam. The creatures were under one meter tall, bulky, and wore dark "diving" suits. 1954 is an important year in the history of French ufology. September 10, 1954, in Quarouble, in the North of France, Marius Dewilde, as he was reading the newspaper, sees, on the railway a dark mass. He hears steps that approach and sees two small beings who advance towards him. As he approaches to catch one of them, he is paralysed by a ray. The two small beings disappear then in their machine which rises from the ground. September 10, 1954, in Quarouble, in the North of France, Marius Dewilde, as he was reading the newspaper, sees, on the railway a dark mass. He hears footsteps which approach and sees two small beings which advance towards him. As he approaches to catch one of them, he is paralysed by a ray. The two small beings then disappear in their craft which rises from the ground. Marius Dewilde (34), a metal worker at the Blanc-Misseron steel works, was at reading by the fire in his house in a wooded area 1.5km from Quarouble, his wife and son having gone to bed, when the dog outside began howling. Thinking there was a prowler, he went to investigate. From his garden he noticed a dark mass, which he took to be a farmer’s cart, on the railway tracks, less than 6m away. Just then his dog crawled up to him, and he heard footsteps to his right. Turning his flashlight, he saw, behind the fence 3-4m away, not the expected smugglers (Quarouble is close to the Belgian border), but two creatures dressed in one piece divers’ suits, with their heads encased in divers’ helmets. They were only about 1m tall, but very broad shouldered, and their helmets looked enormous. Their legs appeared small and he was unable to see any arms. Marius rushed to the garden fence to grab one of the creatures, but as he got within 2m, he was blinded by a brilliant beam, like a magnesium flash, coming from a square opening in the dark mass on the railway tracks. He found himself paralysed, unable to move or cry out, and while in that state heard the creatures depart towards the railway. When the beam of light went out he recovered his senses and saw the dark mass hovering of the railway and a sort of door closing, thick black steam was coming out of the bottom of this object, with a low whistle. The object then rose up to 30m then turned east towards Anzin, becoming a reddish luminosity then disappearing. Marius, in a state of shock, woke his wife, and then reported the matter to the police at Onnaing about 1.5km away in an extremely agitated manner. Police investigations found that in five places, on three of the wooden sleepers, identical depressions about 345mm square, fresh and sharply cut, three in a row 45cm apart on one tier, the other two on either side of the lie formed by these three and 70cm from it. The gravel in the rail bed appeared brittle as if subjected to a high temperature, and blackish traces were found. The prints were such that it was calculated that a weight of 30 tons would have been need to produce them. Vallee Case 144 citing Le Parisien + Combat+ Le Figaro, all of 13 September 1970. Sep. 10 - Quarouble. A metal worker, Marius DeWilde, came out of his house as a dog was barking and saw a dark object on the railroad tracks, then saw two dwarfs walking toward it. When he tried to stop them, he was paralyzed by a strong orange light beam. The creatures were under one meter tall, bulky, and wore dark "diving" suits. 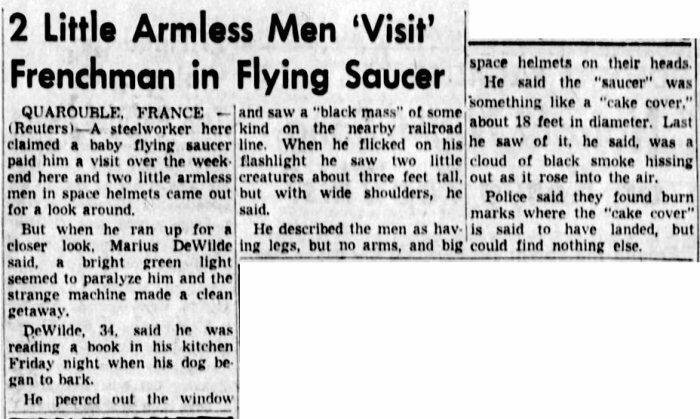 *Sep. 10, 1954 - A metal worker, Marius Dewilde, age 34, came out of his house in Quarouble, France when his dog was barking and saw a dark object sitting on the railroad tracks. He then observed two dwarfs walking toward it. When he tried to stop them, he found himself paralyzed as a strong orange beam of light that was projected at him. The beings were under 1 meter (3.3 feet) tall, bulky, and wore dark diving suits. No faces or arms were visible. Imprints were made by an object, that an engineer estimated must have weighed 30 tons. French police and the French Air Force investigated the case. (Sources: Le Parisien, September 13, 1954; Aime Michel, Flying Saucers and the Straight Line Mystery, p. 44; Jacques Vallee, Passport to Magonia, p. 209). In Quarouble, around 10:30 p.m. on September 10, 1954, Marius Dewilde, walking his dog, nervous, would fall face to face with the two occupants of what appears to be a flying saucer. Illuminating them with his flashlight, he notices that they are small and covered with a suit accompanied by a helmet. At his approach, both are paralyzing him and leave him on the spot to get away with the gear nearby. The batteries in the lamp were unloaded and the dog died six months later. Summary: Hearing his dogs barking, Marius Dewilde went out and saw a dark mass on the railroad track, less than 6 yards away. On hearing footsteps, he turned his flashlight on the path, where he saw 2 very short beings (less than 3.5 ft) wearing “diver’s suits.” No arms could be seen. He approached within 6 ft, when he was blinded and paralyzed by a brilliant light emanating from the mass of the tracks. The two creatures went toward the object. When the beam of paralyzing light went out, he ran towards the track, but the object was now rising, emitting a “thick dark steam” and a low whistling sound. It became red luminous and flew away. On the railroad ties where found 5 imprints; it was calculated that a 30-ton weight would have been necessary to produce them. Recent information uncovered about the case indicates that Dewilde found after the craft took off a mysterious metallic black box. He took the box home and attempted to open it, without telling local police about it. After several failed attempts he finally gave up and hid the black box inside a carton. According to Dewilde shortly after this several French Air Force officers who somehow knew about the existence of the black box and took possession of it visited him. This database recorded this case 53 times instead of one! Marius Dewilde with a police officer during the police investigation. Marius Dewilde with a police officer and other people, probably co-workers. Dewilde with his kid in front of his little house near the railway. Dewilde interviewed at his house by a Pathé reporter. Dewilde interviewed at his house by a Pathé reporter. Wife and kid at the door behind. The little house, near the railway. Dewilde interviewed. The reporter made fun of his modest background, asking irrelevant questions with complicated words Dewilde could not understand: "What do you think of the antagonism between the US and the Soviet?" 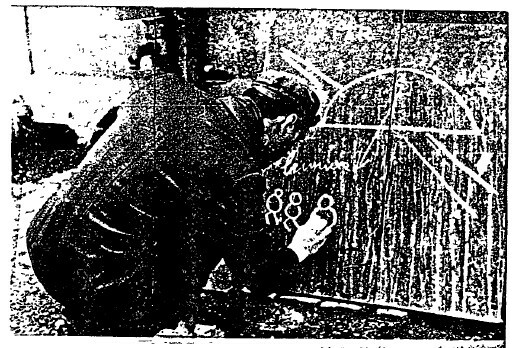 Drawing the bottom of the strange apparatus with chalk on his door. 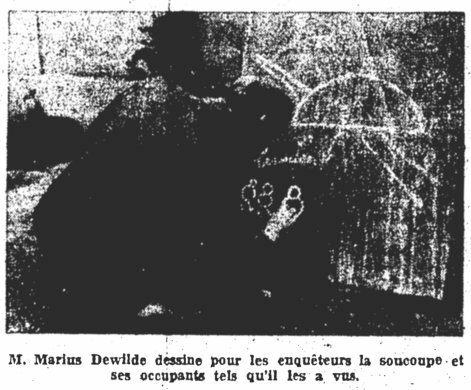 Left: sketch of the entities he claimed to have seen, by Marius Dewilde in front of the camera of Pathé movie news, in September 1954. The case file is huge, please understand that there is much more to it, including the witness's own book on the events. [---] Article in the regional newspaper La Voix du Nord, France, September 12, 1954. [la1] Article in the national newspaper L'Aurore, France, September 13, 1954. 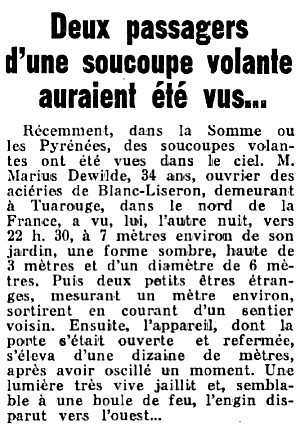 [vm1] Article in the regional newspaper Var-Matin République, Toulon, France, September 13, 1954. [---] Article in the national newspaper Le Parisien Libéré, Paris, France, September 13, 1954. [---] Article in the national newspaper Combat, Paris, France, September 13, 1954. [---] Article in the national newspaper Le Figaro, Paris, France, September 13, 1954. 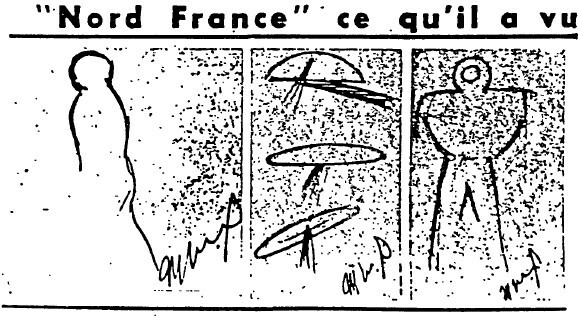 [li1] Article in the national newspaper Libération, Paris, France, September 14, 1954. [pp1] Article in the national newspaper Paris-Presse, Paris, France, September 14, 1954. [qh1] Article in the regional newspaper Le Quotidien de la Haute-Loire, France, September 14, 1954. [fa1] Article in the foreign newspaper Feuille d'Avis, Lausanne, Switzerland, September 14, 1954. [st2] Article in the foreign newspaper The Star Tribune, Minneapolis, Minnesota, USA, page 9, September 14, 1954. [---] Article in the regional newspaper Nord-Eclair, Lille, France, September 15, 1954. [---] Article in the national newspaper France-Soir, Paris, France, pages 1,6, September 15, 1954. [ne1] Article in the regional newspaper Nord-Eclair, Lille, page 1 and last, France, September 16, 1954. [---] Article in the national newspaper Le Franc-Tireur, Paris, France, September 16, 1954. [fa2] Article in the foreign newspaper Feuille d'Avis, Neuchatel, Switzerland, September 16, 1954. [---] Article in the regional newspaper Nord-France, France, September 17, 1954. [st3] Article in the foreign newspaper The Star Tribune, Minneapolis, Minnesota, USA, page 9, September 19, 1954. [si1] Article in the foreign newspaper Le Soir Illustré, Belgium, September 24, 1954. 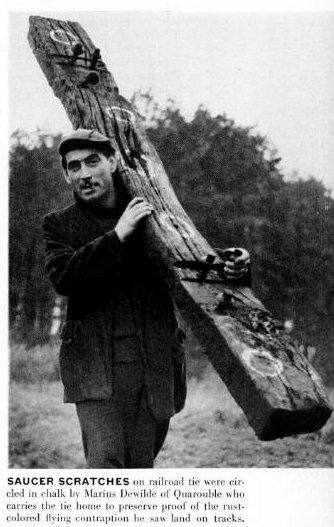 [ca1] Photograph in an article in the regional newspaper La Croix de l'Aisne, France, September 26, 1954. [---] Article in the regional newspaper La Croix du Nord, Paris, France, September 29, 1954. [---] Article in the national newspaper France Soir, Paris, France, September 29, 1954. [---] Article in the magazine Radar, September 29, Paris, France, 1954. [st1] Article in the foreign newspaper The Star Tribune, Minneapolis, Minnesota, USA, page 12, September 30, 1954. 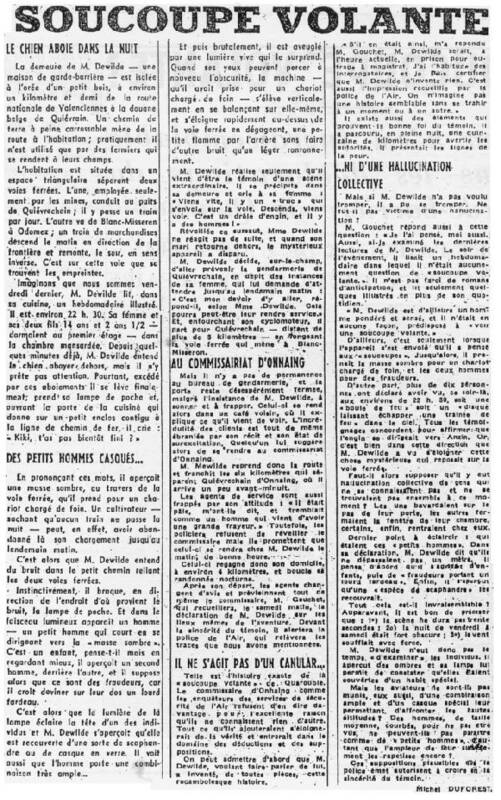 [er1] Article in the regional newspaper L'Est Républicain, France, page 1, October 5, 1954. [fs1] Article in the newspaper France-Soir, Paris, France, October 9, 1954. [ss1] Article in the national newspaper Samedi-Soir, Paris, France, October 14, 1954. [sm1] Article in the foreign newspaper The Sydney Morning Herald, Sydney, New South Wales, Australia, page 9, October 16, 1954. [es1] Article in the national newspaper Evening Star, Washington D.C., USA, October 19, 1954. [ti1] Article in Time magazine, USA, October 25, 1954. [ms1] Article in the foreign newspaper The Marion Star, Marion, Ohio, USA, page 34, October 28, 1954. 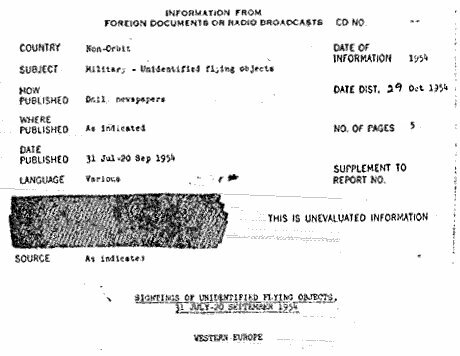 [ci1] "Information from Foreign Documents or Radio Broadcast - Sightings of Unidentified Flying Objects, 31 July - 20 September 1954", report by the CIA (Central Intelligence Agency, USA), pp 1,3, October 29, 1954. [li1] Part of the article "Astral Adventurers - Frenchmen report meetings with unlikely creatures", in LIFE Magazine, USA, page 29, November 1, 1954. [gb1] "Europe invaded by little men, article by Gray Barker, in his flying saucers magazine The Saucerian, Gray Barker editor, USA, Vol. 3, No 1, page 16, January 1955. [---] "Black-Out sur les Soucoupes Volantes", book by Jimmy Guieu, Fleuve Noir publisher, France, pp 130-133, 1956. [---] Ufology magazine Ouranos, Vol.IX, #24, pp 11-12 and 20-21. [mc1] "Les Apparitions de Martiens", book by "Michel Carrouges" (pseudonym of Louis Couturier), Fayard publisher, France, page 80, 1963. [jv6] "Anatomy of a Phenomenon", book by Jacques Vallee, Henry Regnery publisher, USA, 1965. [lc1] "Piece for a Jigsaw", book by Leonard G. Cramp, Somerton Publishing Co publishers, U-K., 1966. [jv6] "Anatomy of a Phenomenon", book by Jacques Vallee, Neville Spearman publishers, U-K., 1966. [---] "Flying Saucers – Serious Business", book by Frank Edwards, Bantam publisher, USA, pp 57-59, 1966. [---] "Flying Saucers – Serious Business", book by Frank Edwards, Mayflower-Dell publishers, USA, pp 64-65, 1966. [ob1] "Flying Saucers Are Watching Us", book by Otto Binder, Belmont publisher, USA, 1968. [jv1] "Passport to Magonia", book by Jacques Vallée, pp 17-18, pp 209-223, Henri Regnery publisher, USA, 1969. [jv1] "Passport to Magonia", book by Jacques Vallée, pp 17-18, pp 209-223, Tandem publishers, USA, 1970. [jv1] "Chronique des Apparitions Extra-Terrestres", French translation of "Passport to Magonia", book by Jacques Vallée, Denoel publisher, France, page 258, 1972. [---] "Mysterious Visitors: the UFO Story", book by Brinsley Le Poer Trench, Stein & Day publishers, USA, 1973. [jv6] "Anatomy of a Phenomenon", book by Jacques Vallee, Tandem publishers, U-K., pp 68-69, 1974. [jv2] Summary by Jacques Vallée in "En Quête des Humanoïdes", book by Charles Bowen, French translation of "The Humanoids", J'ai Lu publisher, France, page 36, 1974. [---] Interview of Marius Dewilde by Jacques Lob, in "Imagine", #2, pp 5-8, 1975. [---] "La Nouvelle Vague des Soucoupes Volantes", book by Jean-Claude Bourret, France Empire éditeur, France, pp 113-123, 1975. [---] Official UFO, USA, February 1976. [pd1] "Le Grand Livre des Objets Volants Non-Identifiés", book by Pierre Delval with the Ouranos Committee, De Vecchi publisher, France, pp 247-248, 1976. [ls1] "Situation Red: The UFO Siege! ", book by Leonard Stringfield, Doubleday and Co publisher, 1977. [jv5] "Catalogue préliminaire de 500 observations", listing in "Les Phénomènes Insolites de l'Espace", book by Jacques and Jannine Vallée, Robert Laffont publisher, France, page 248, 1978. [cg1] "Parapsychologie ou Escamotage? ", article by Charles Garreau, ufology magazine "Lumières dans la Nuit," #179, page 3, November 1978. [ls1] "Alerte Générale OVNI", book by Leonard Stringfield, French translation of "Situation Red: The UFO Siege! ", France Empire publisher, page 112, 1978. [pd2] "Contacts du 4ème type", book by Pierre Delval, De Vecchi éditeur, p.190-191, 1979. [db1] "Close Encounters at Kelly and Others of 1955", monography by Isabel Davis and Ted Bloecher, J. Allen Hynek Center for UFO Studies (CUFOS), USA, page XVi, 1978. [jr1] "Le Dossier des Extra-Terrestres", book by Jacques Rivoyre, Vernoy publishers, Switzerland, page 103, 1979. [---] "OVNI: Le Premier Dossier Complet des Rencontres Rapprochées", book by Michel Figuet et Jean-Louis Ruchon, Alain Lefeuvre éditeur, France, 1979. [---] "Les Soucoupes Volantes: Le Grand Refus? ", book by the G.A.B.R.I.E.L. team, Michel Moutet éditeur, France, 1979. [---] "Ne Résistez Pas Aux Extraterrestres", book by Marius Dewilde et Roger-Luc Mary, Du Rocher éditeur, France, 1980. [cc1] "Ephémérides des Années d'Espoir de l'Ufologie", article by Gilbert Cornu and Henri Chaloupek, in the ufology magazine Lumières Dans la Nuit (LDLN), #255-256, page 20, September/October 1985. [---] "Le Diabolique Secret des O.V.N.I", article by J. M. Lesage, comité d'enquête Ouranos, 1995. [gc1] "Jusqu'où ne pas aller trop loin! ", article by Gilbert Cornu, May 1986. [jv7] "Dimensions - A Casebook of Alien Contacts", book by Jacques Vallée, Souvenir Press publishers, U-K, page 24, 1988. [dc1] "Le Baron Noir et ses Ancêtres - Chronique des Aéronefs Fantômes", article by Dominique Caudron, in the Communications magazine, special "Rumours and contemporary legens", France, #52, page 237, 1990. [jv9] "Forbidden Science, book by Jacques Vallée, North Atlantic Books publishers, USA, page 15, 1992. [lg1] "UFOs: A History - 1954 - September", monography by Loren E. Gross, USA, pages 18,19.20, 1991. [qs1] "Les OVNIS", book by Michel Dorier and Jean-Pierre Troadec, Presse Universitaire de France publishers, "Que sais-je?" collection, 2nd corrected version, France, pp 32-33, 1992. [pb1] "UFO - The Complete Sightings", book by Peter Brookesmith, Barne & Noble publishers, USA, pp 58-59, 1995. [---] "Le Diabolique Secret des O.V.N.I", article by J. M. Lesage, Ouranos investigation committee, France, 1995. [lc1] "UFOs and Anti-Gravity: Piece for a Jigsaw", book by Leonard G. Cramp, Adventures Unlimited Press publishers, U-K., pp 229-232, 1997. [se1] "UFO-Related Human Physiological Effects", paper by John F. Schuessler, in "Physical Evidence Related to UFO Reports, The Proceedings of a Workshop Held at the Pocantico Conference Center, Tarrytown, New York September 29 – October 4, 1997", published by the Journal of Scientific Exploration, USA, 1997. [---] "Faces of the Visitors", book by Kevin D. Randle and Russ Estes, Fireside - Simon and Schuster publishers, USA, page 265, 1997. [jc1] "Epistémologie du Phénomène Ovnien ou Cinquante Ans de Déni Scientifique", book by Jacques Costagliola, L'Harmattan publisher, France, pp 155-156, 1998. [ab1] "The Encyclopedia of Alien encounters", book by Alan Baker, Virgin Books publishers, U-K., pp 274-275, 1999. [hn1] "O.V.N.I. Enquête sur des Faits", book by Hugo Hnart, Carnot publishers, France, page 121, 1999. [bj1] "Science Meets the UFO Enigma", book by Desmond et and Paul Joslin, Kroshka éditeurs, USA, pages 24,38, 2000. [lo4] "Quarouble (France) Encounter", article by Coral and Jim Lorenzen, in "The Mammoth Encyclopedia of Alien Encounters", book edited by Ronald Story, New American Library publishers, USA, 2001. [lo4] "Quarouble (France) Encounter", article by Coral and Jim Lorenzen, in "The Mammoth Encyclopedia of Alien Encounters", book edited by Ronald Story, Robinson publisher, U-K., pp 548-549, 2001. [sd1] "Occupants Database", listing by Steven Dunn, USA. [dj1] "Encounters with Aliens on This Day", written by Donald A. Johnson, Ph.D., compiled from the UFOCAT 2003 computer database, www.ufocat.com. [ar1] HUMCAT (Humanoids Reports Catalog), Albert Rosales. [rh1] "UFO Occupant Sightings", listing by Richard H. Hall, NICAP website, www.nicap.org. [gm1] "Catalogo de los Primeros Casos de Humanoides Clasificado por Paises" (Firsthumcat), listing par Luis R. Gonzales Manso, Funcacion Anomalia, Espagne, page 11, 2002. [tp2] "Physical Traces - Occupants and Physical Traces", article by Ted Phillips in the ufology magazine MUFON UFO Journal, Mutual UFO Network (MUFON), USA, #449, page 18, September 2005. [jc2] "La Pathologie des Victimes d'Incidents Ovniens", article by Jacques Costagliola in the sensationalist magazine Top Secret, France, pages 21,22, December 2009 - January 2010. 0.1 Patrick Gross July 22, 2004 First published. 1.0 Patrick Gross June 16, 2010 Conversion from HTML to XHTML Strict. Additions [jv5], [dc1], [pb1], [mk1], [bj1]. 1.1 Patrick Gross June 24, 2010 Addition [se1]. 1.2 Patrick Gross July 4, 2010 Additions [jr1], [jv7], [lo4], [ab1], [hn1]. 1.3 Patrick Gross July 6, 2010 Addition [jv6]. 1.4 Patrick Gross July 14, 2010 Additions [li1], [gc1], [lc1], [ud2]. 1.5 Patrick Gross August 16, 2010 Addition [un1]. 1.6 Patrick Gross October 19, 2011 Addition [oo3]. 1.7 Patrick Gross August 13, 2013 Additions [pr1], [un1]. 1.8 Patrick Gross November 15, 2014 Additions [ni1], [ta1]. 1.9 Patrick Gross October 17, 2016 Additions [fa1], [fa2], [mr1]. 2.0 Patrick Gross November 23, 2016 Addition [er1]. 2.1 Patrick Gross December 9, 2016 Additions [si1], [gb1], [jv9], [lg1], [qs1], [ub1]. 2.2 Patrick Gross January 5, 2017 Additions [fs1], [db1]. 2.3 Patrick Gross September 15, 2017 Addition [sm1]. 2.4 Patrick Gross September 19, 2017 Addition [ms1]. 2.5 Patrick Gross September 23, 2017 Additions [st1], [st2]. This page was last updated on September 23, 2017.